In November I posted on clearance aisle tulip bulbs stored in my refrigerator drawer among the carrots and other vegetables. 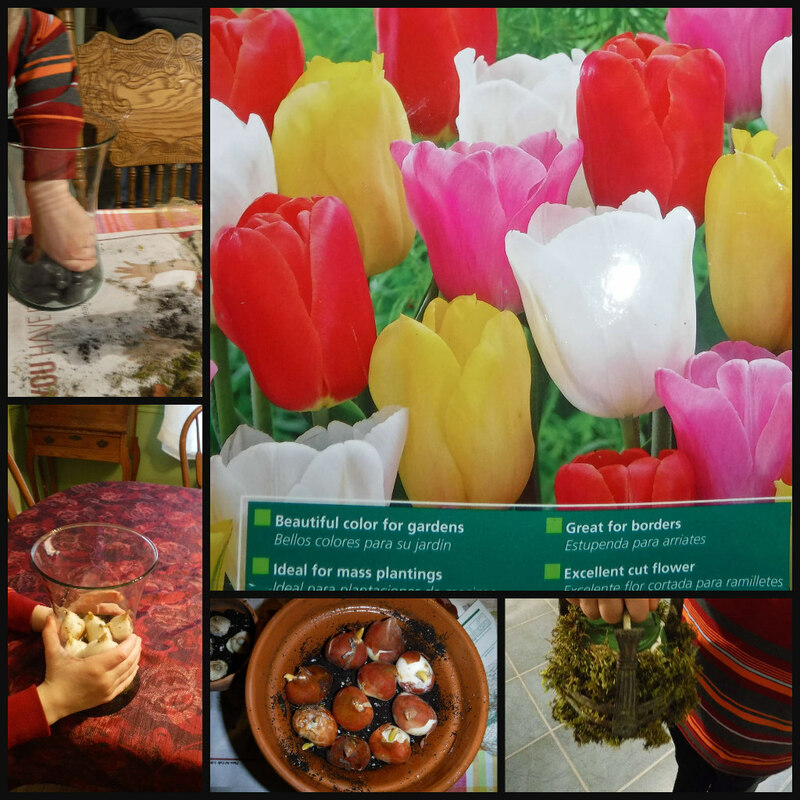 This weekend, to break up another monotonous winter day with hopes of Spring, my youngest grandson helped me begin to force the bulbs. The tulips are in a mixed-colors package. Although we might speculate about which dreamy colors will unfurl, it’s totally a matter of chance as to color combination. The health of a few of the bulbs was in question when we saw some greenish mold around the sprouting end. If the bulb also had a spongy feel I tossed it out. We were left with over two dozen to plant. Most of the bulbs already had about a half inch of stem growth. We planted some in soil in deep terracotta pots and others in shallow ceramics. 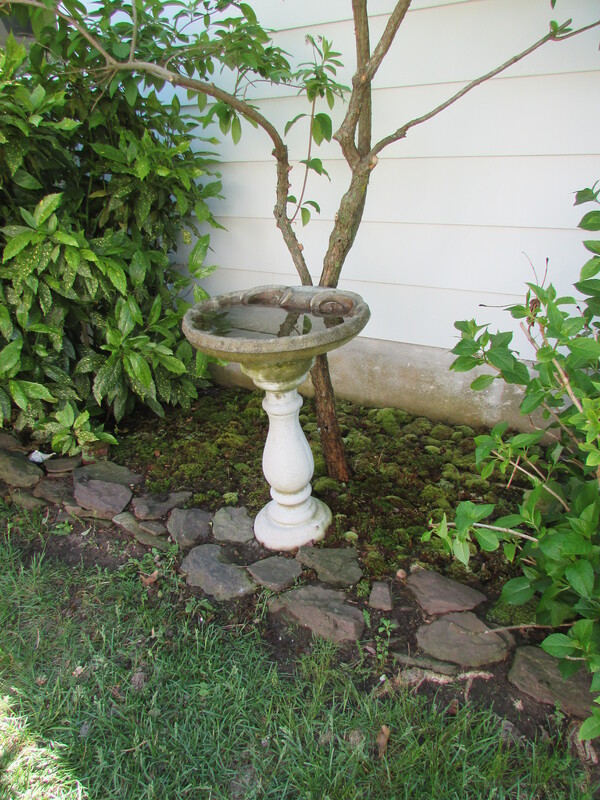 We covered plastic pots with moss to disguise their unnatural appearance and planted in those. 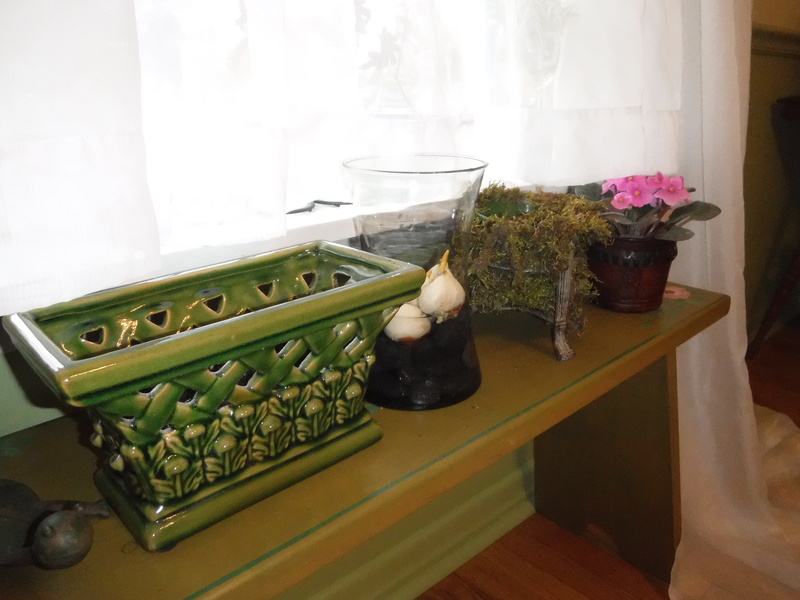 My favorite display is the tall vase with black river rock on the bottom, filled with water to just over the top of the rocks, the tulip bulbs can be watched from start to finish as they develop. 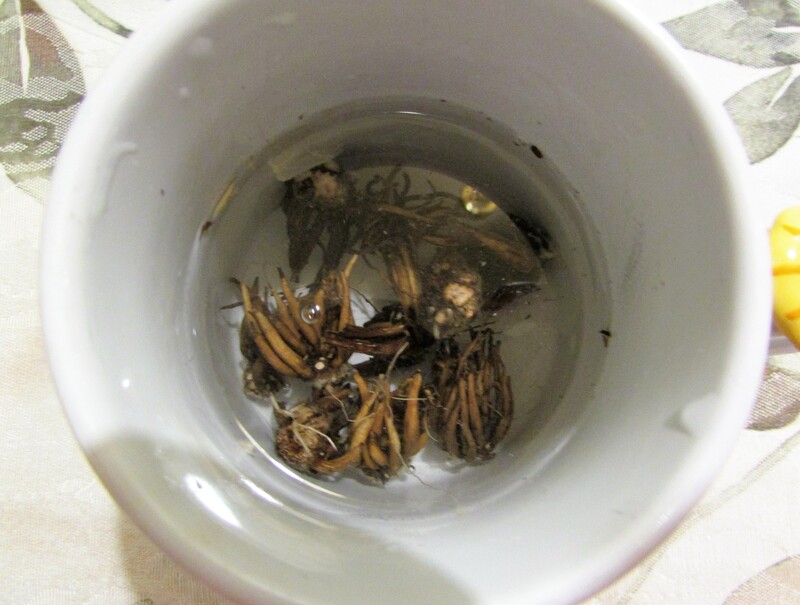 Since we did find a bit of mold we removed the brown covering of the bulbs that show through the glass. I learned something today, the outer layer of paper-like husk on a bulb is called a tunic. While researching the properties of a tulip bulb I discovered a week-long Tulip Celebration in Lewes, Delaware, April 5th – 14th. Lewes is about a three hour drive from our home. It is also accessible from the Cape May/Lewes Ferry. If you love tulips and are near Delaware at this time, perhaps you’ll find time to celebrate in Lewes and welcome Spring. Do you remember the sea bean pod I found on Cape May’s beaches a few weeks ago? 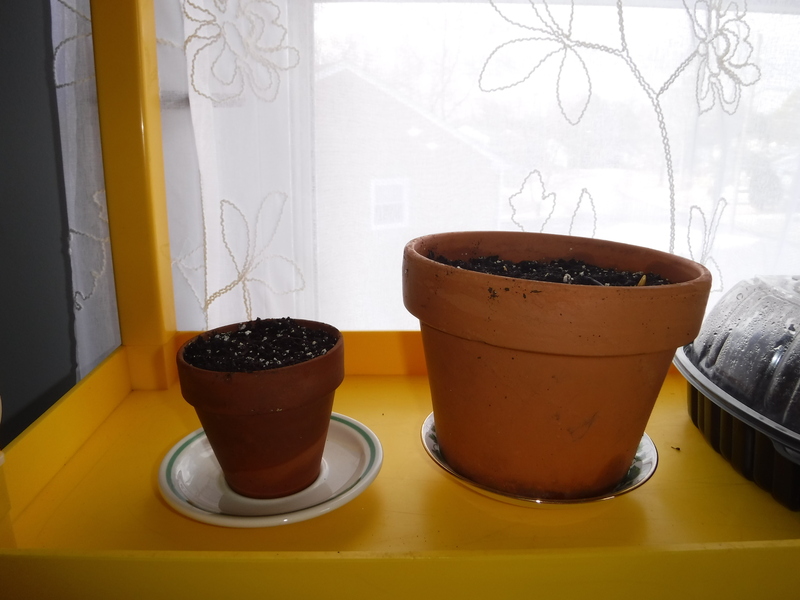 I culled out four of the small trees that sprouted and potted one up to grow to a larger size. 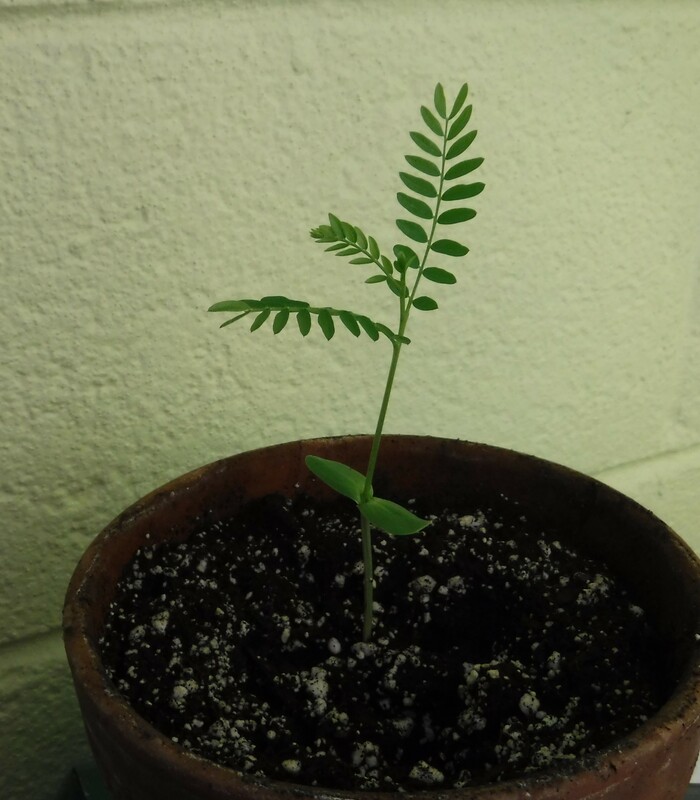 The seedling is most likely a black locust tree, but my daydreams find me still wondering if the pod might have made a seaward journey from the tropics via the Gulf stream to Cape May. 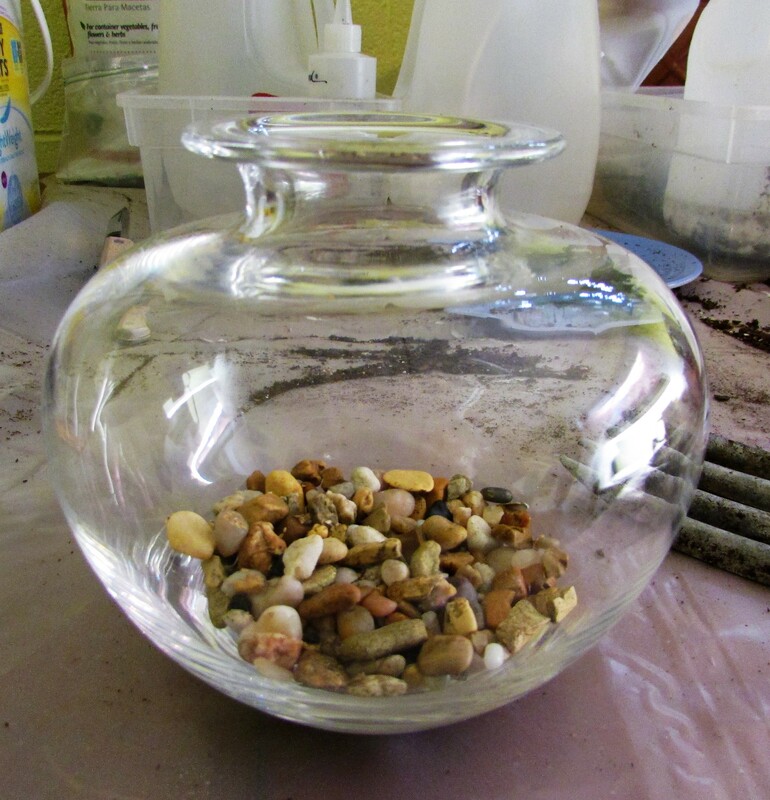 The sea bean seeds are a good example of garden wisdom: nick and soak large seeds before planting. 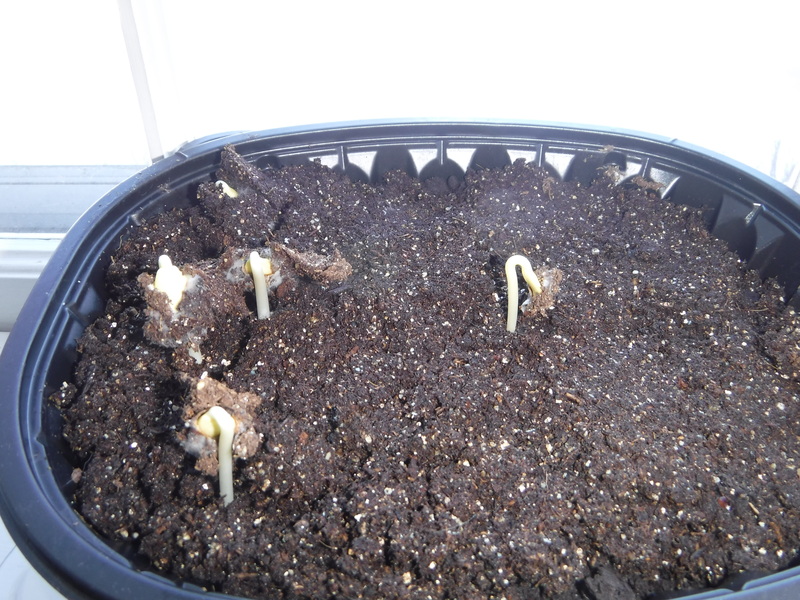 The sweet pea seeds I soaked, and also nicked with a nail clipper, have already sprouted outdoors in the winter sown containers, while those not treated are only beginning to swell a bit. 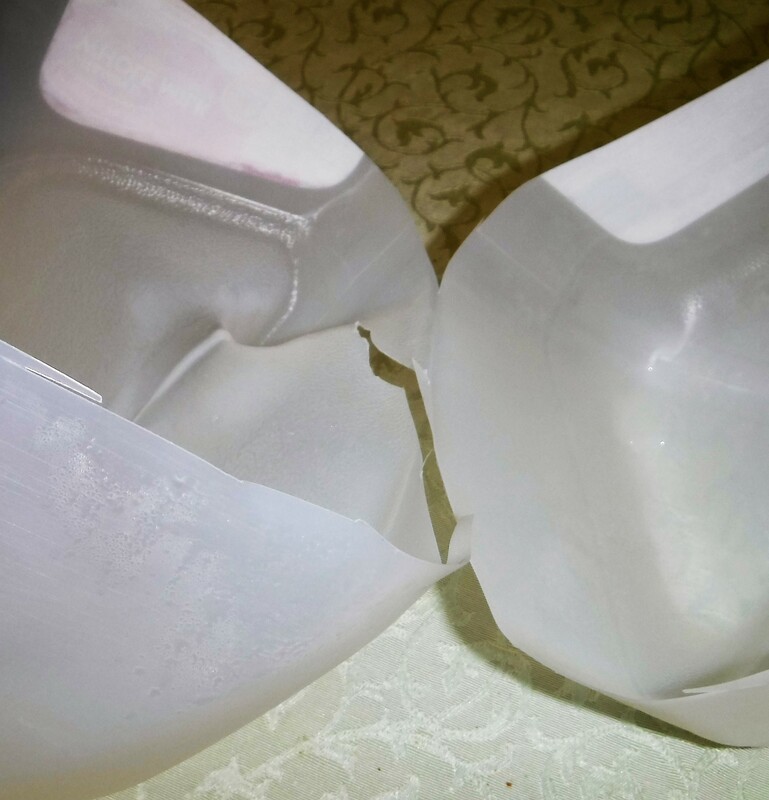 Here’s an inside peek at one of the milk jugs. 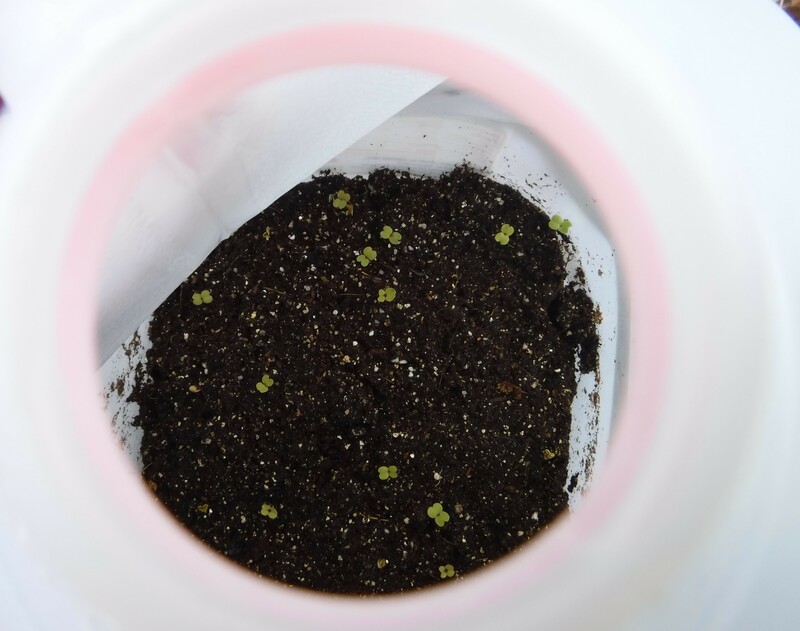 The arugula seeds are already growing. Also sprouting outdoors is broccoli, mustard spinach and the sweet peas. For plants that will only grow in warm conditions, such as coleus, I’m having good luck in the basement. 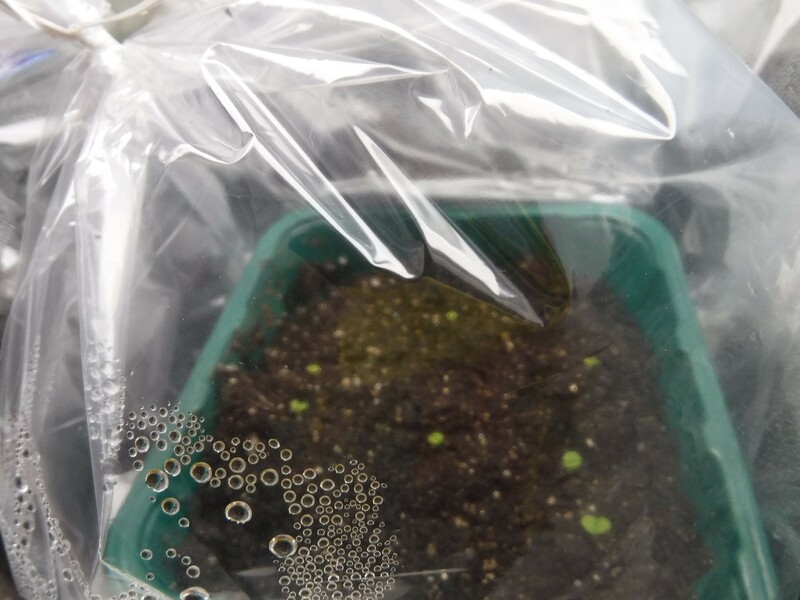 A small heater inside a plastic covered light table mimics a greenhouse and the seeds are sprouting well. They will not need to be thinned since I sowed them with the small seed sowing method. Every year one of my gardening goals is to try one new and unique vegetable or flower. 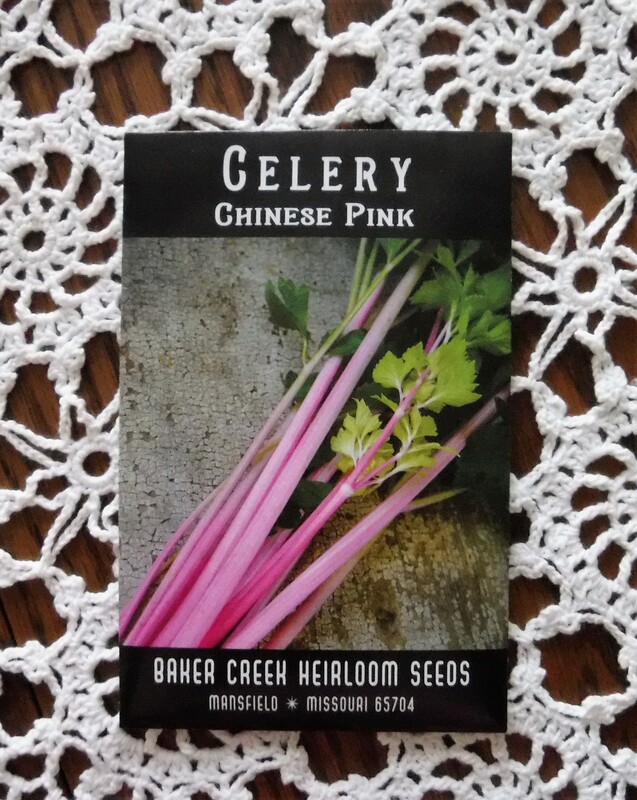 This year I chose pink celery from Baker Creek Heirloom Seeds. I won’t be at fault if the celery doesn’t grow. Although I’ve never grown celery before, I’m planning to start it three ways. 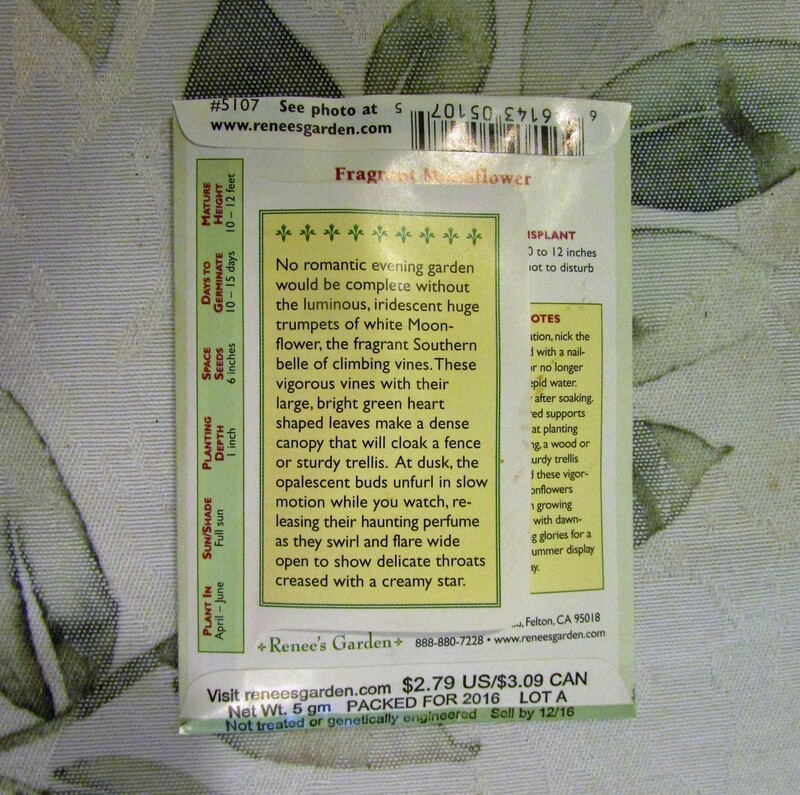 The package says to begin 8 – 12 weeks before the last frost. That time is now. Last night I planted the celery in a milk carton for winter sowing. Tonight I will plant it in flats to grow under lights inside. 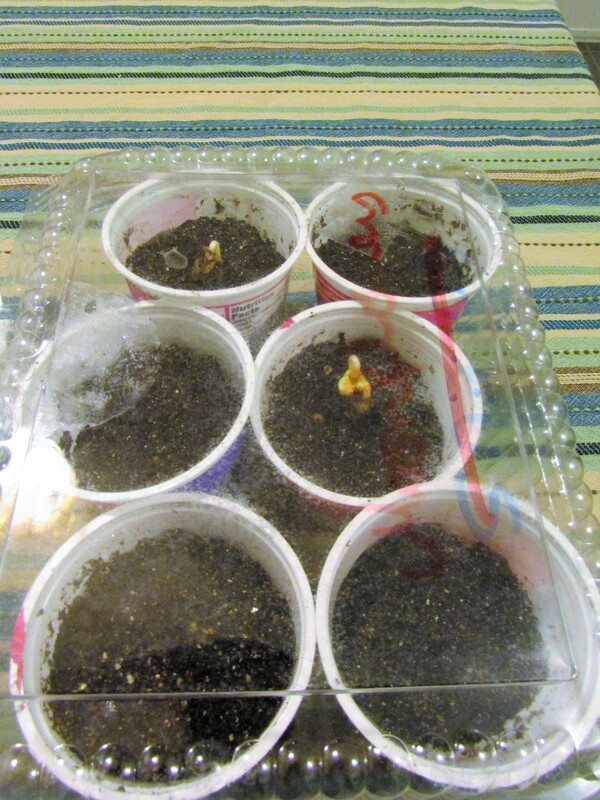 Lastly, when the soil warms, I will try a few seeds directly in the soil. Pink Celery…I think it odd enough to be part of Kammie’s Oddball Challenge this week. I can’t wait to show this oddball vegetable to my grand-daughters and their mother…they all love pink! I’ve saved milk cartons in the basement for months. 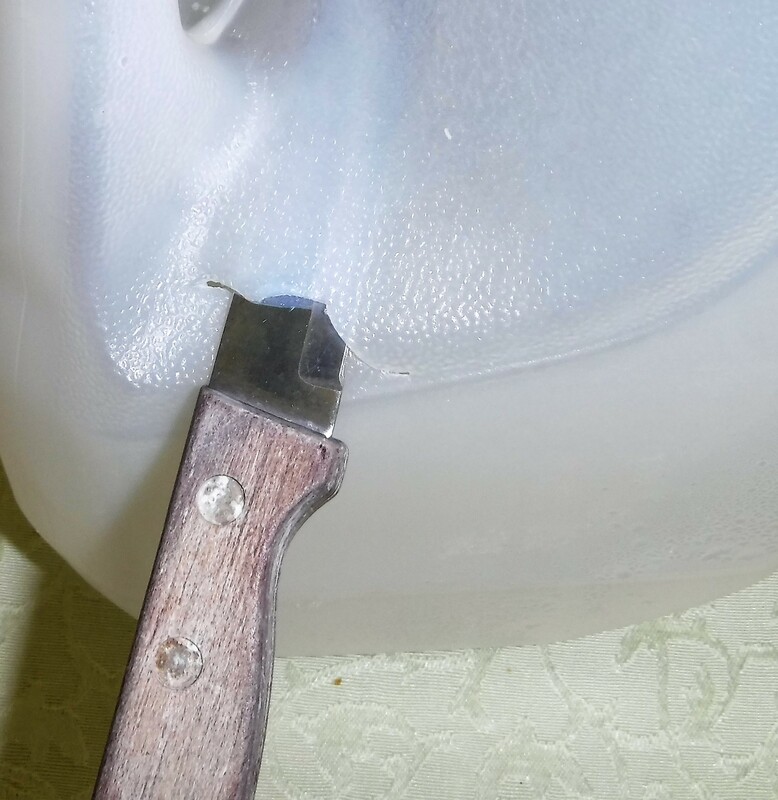 Begin by inserting a paring knife into the carton 3-4 inches from the bottom, near the handle. After I make a small slit with the paring knife I cut around the bottom with scissors. 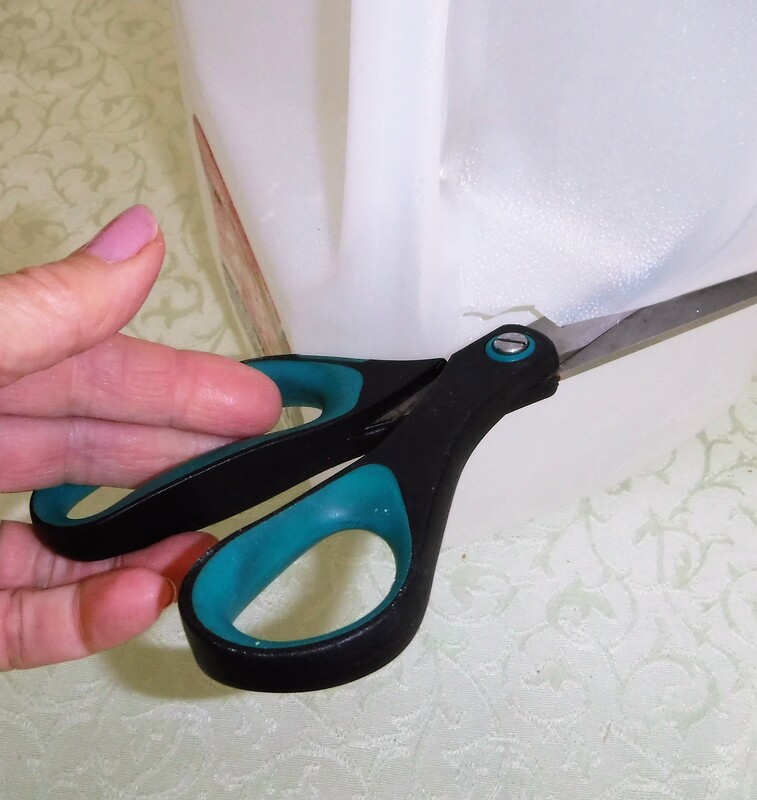 Stop before you cut all the way through, leaving a bit of carton near the handle to join the top and bottom. This makes taping the carton shut easier. I place the bottom of the carton in my kitchen sink over the drain. 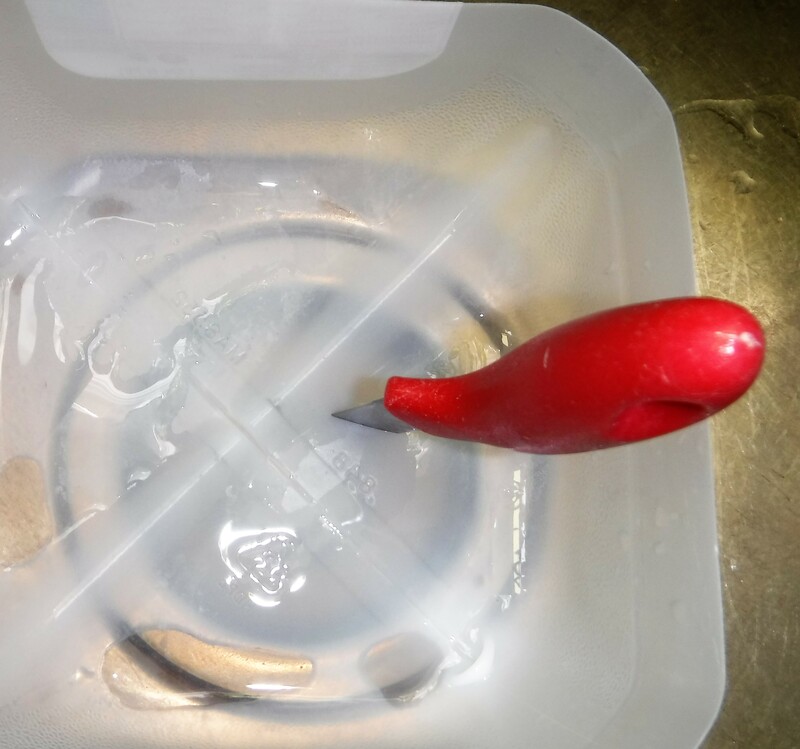 I push my paring knife through the carton bottom in four spaced out spots. I insert the scissors in the slits and twist. This creates four large drainage holes. 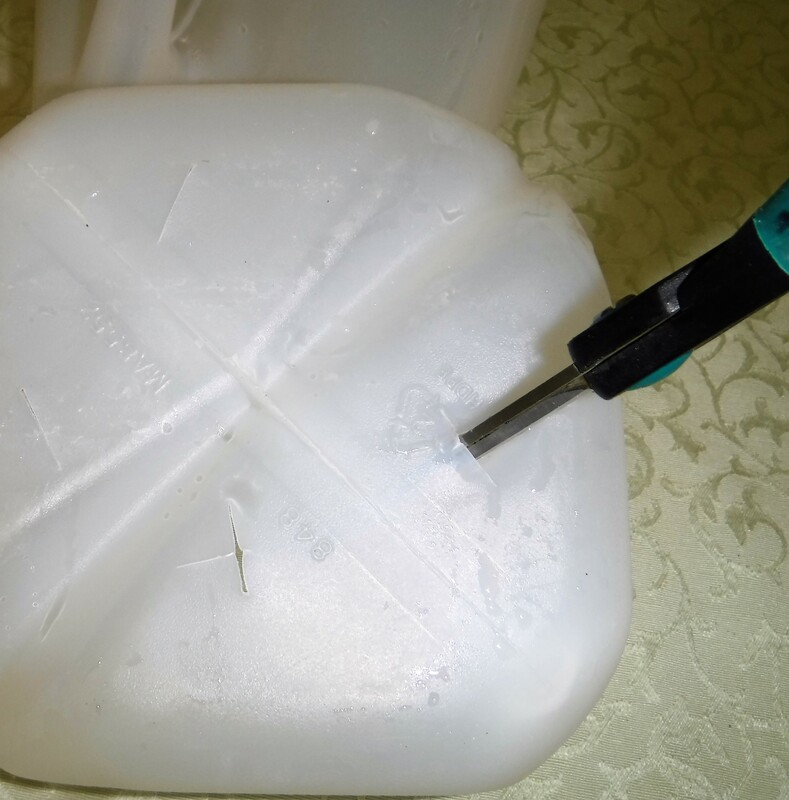 In the past I used a hot screw driver to make holes, but this process is easier and you don’t inhale toxic fumes from the melting plastic. 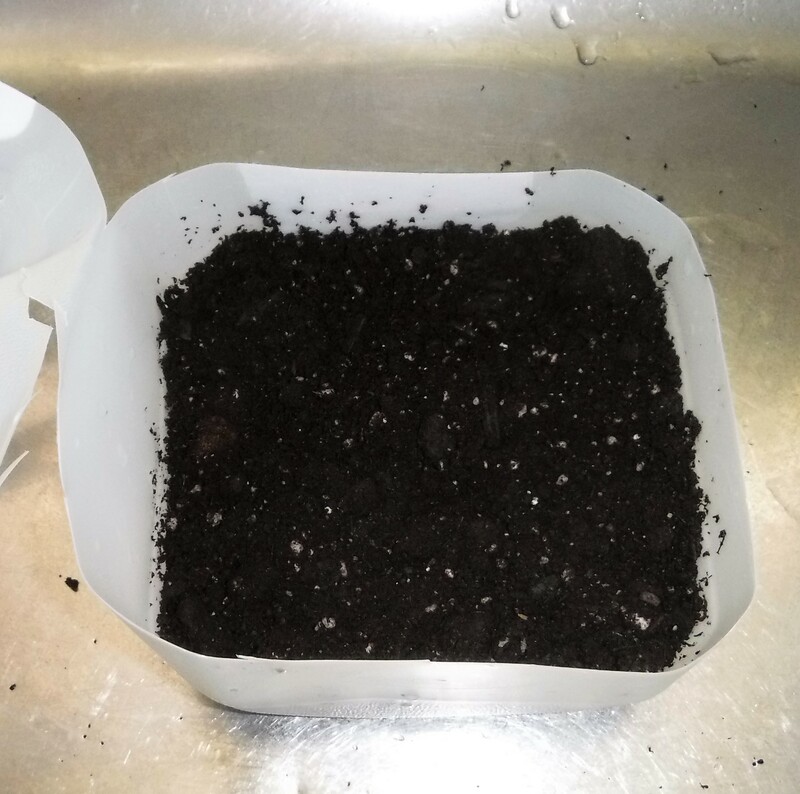 I fill the bottom of the carton with 1 1/2 inches of sterile organic potting soil. 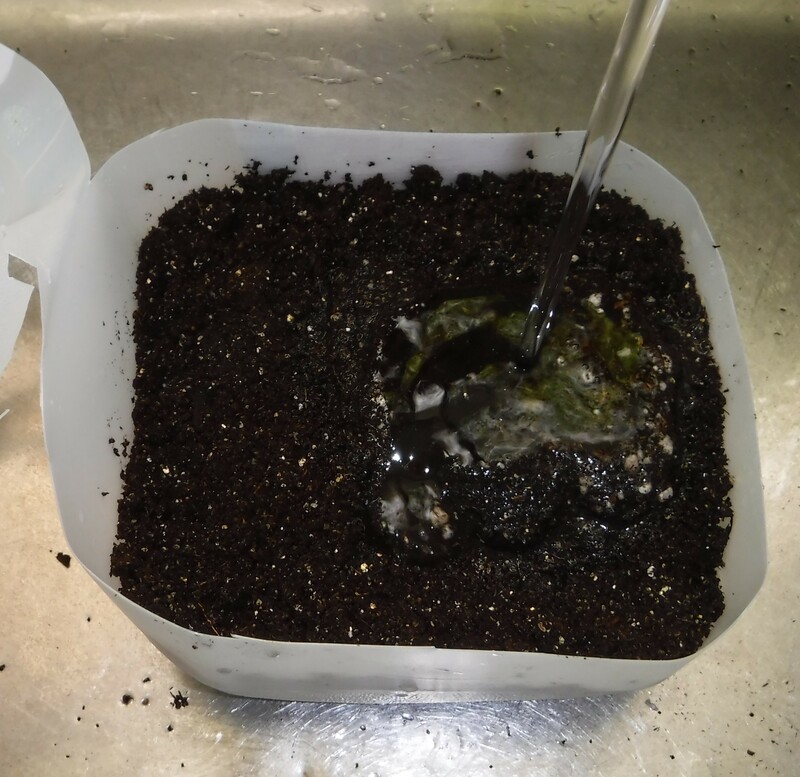 On top of the potting soil I add an equal amount of organic seed starter soil. 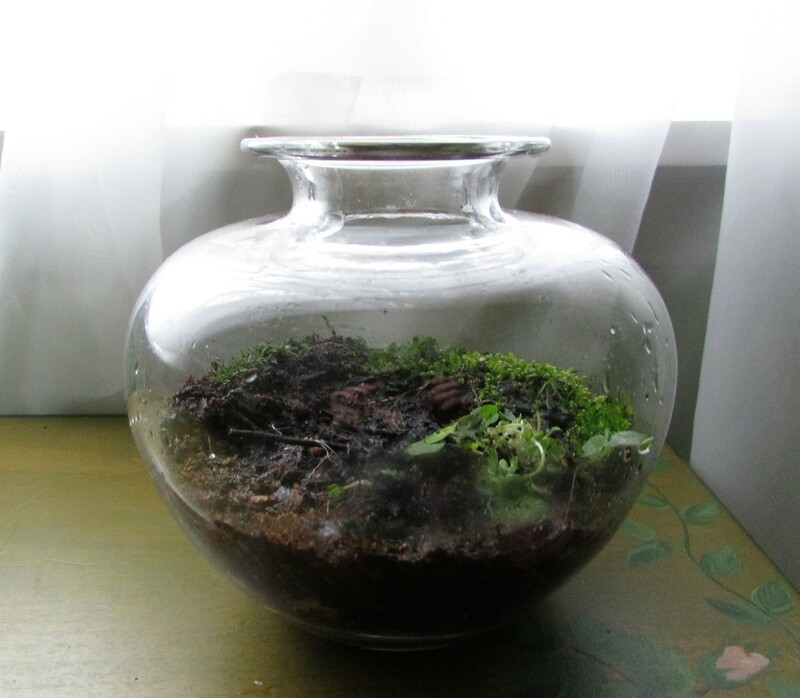 I water this until it is soaked and then let it fully drain. 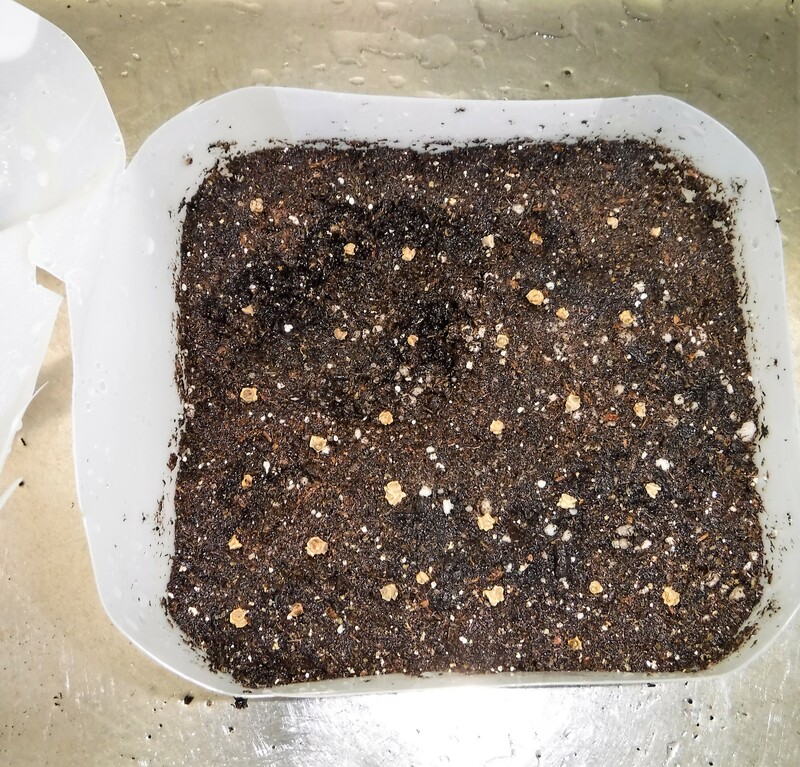 I sow my seeds and cover with a thin layer of seed starter. If I keep the top layer very thin it will usually wick up water from the layer of seed starter soil beneath it. I label the top with permanent marker. I have to keep a close eye on the labeling. The letters will fade in just weeks. It’s vital to reapply the marker when the letters lighten or I’ll be guessing as to which seedling is what. 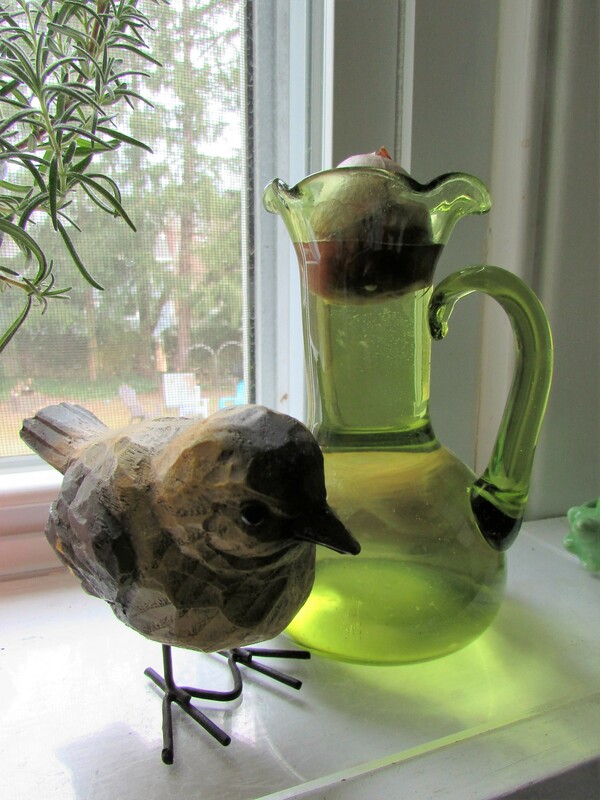 Tape the edges together with duct tape and place outside in a sunny spot. 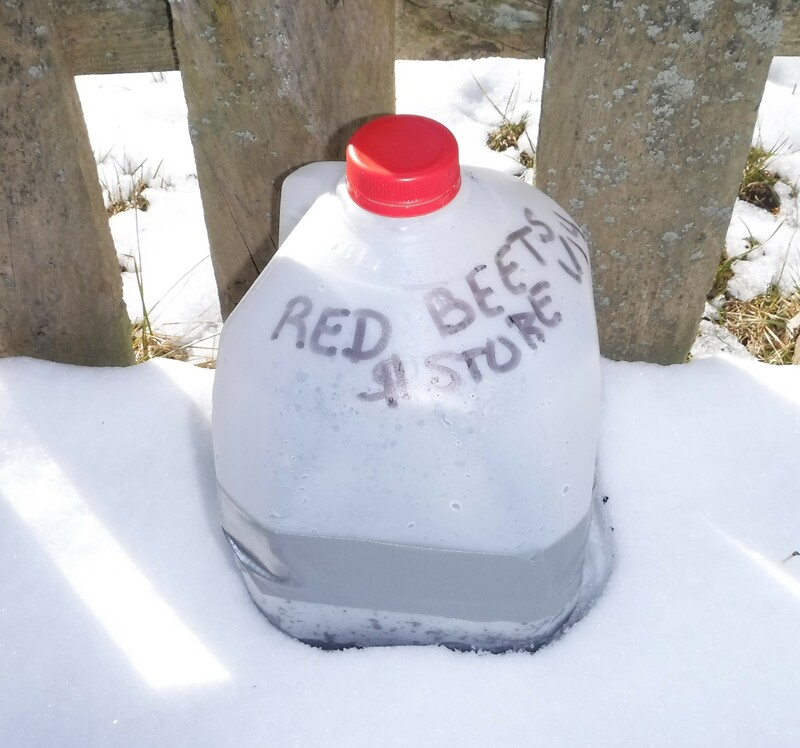 The wet soil in the carton bottom has always kept my cartons grounded, even in windy winter weather. I will remove the cap later today or the seeds might become too hot in warmer weather. 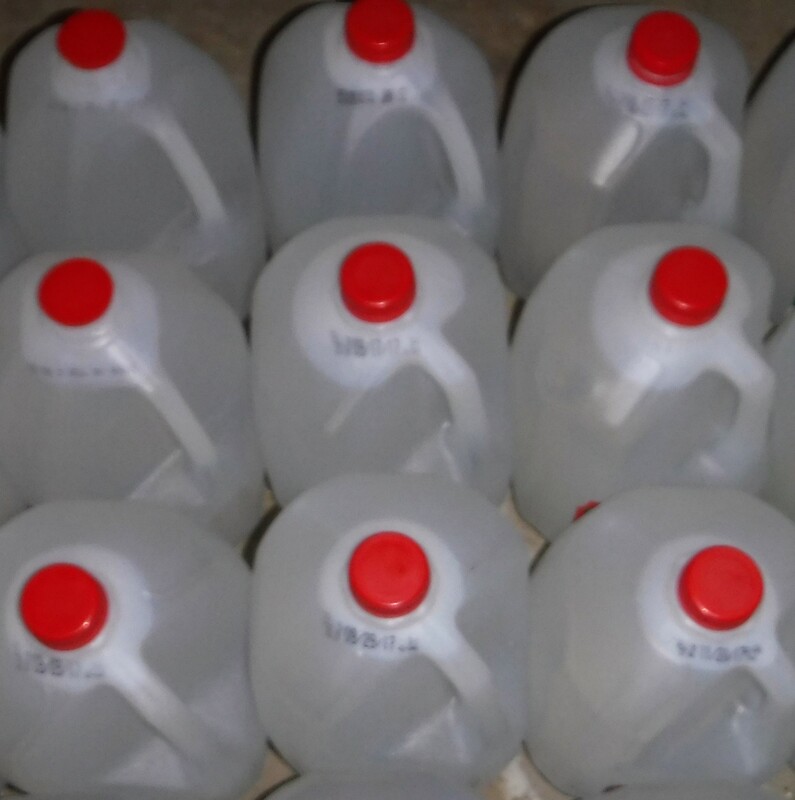 I usually don’t quit my winter sowing madness until every spare milk carton is filled. 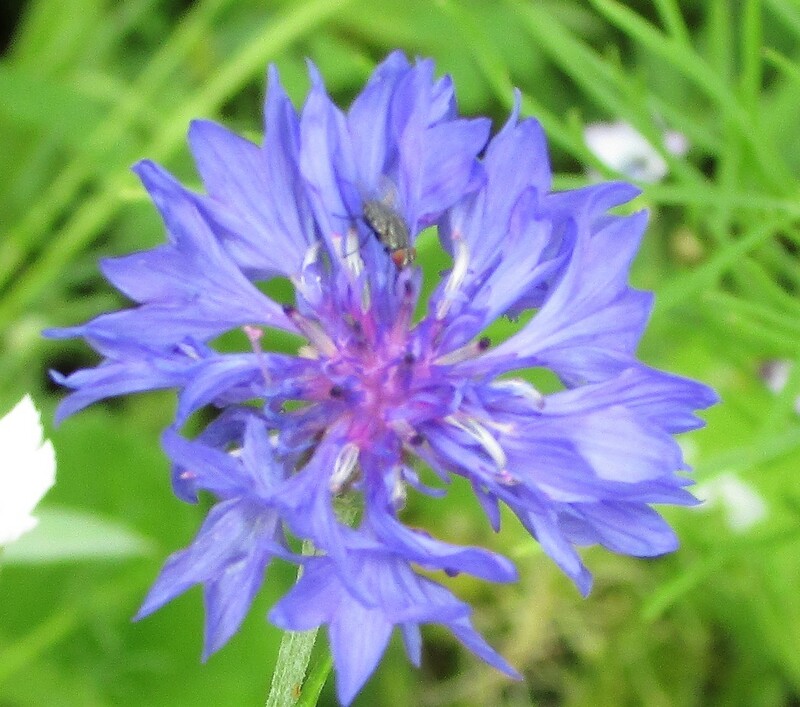 You can find lists of which plants do best started this way on the Winter Sowing site. Happy Gardening! 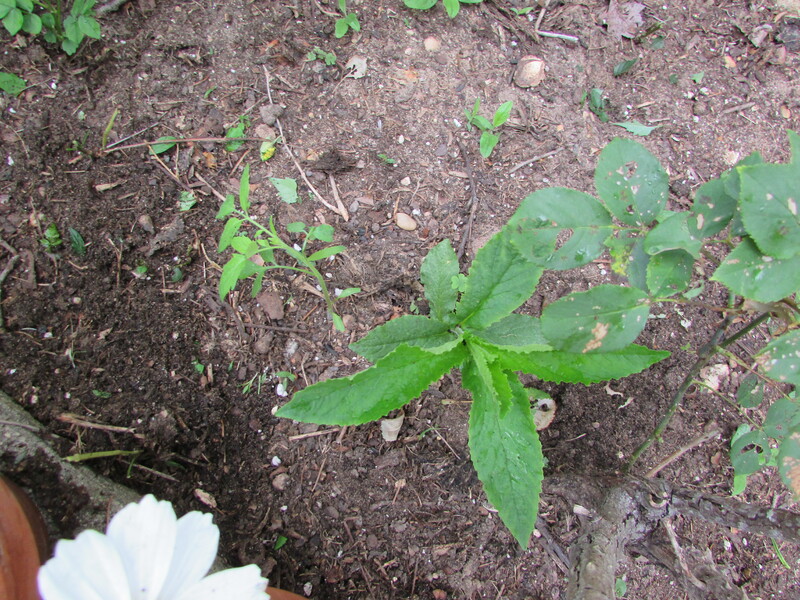 The plant in the photograph had its beginnings in the sparse leaves atop a pineapple. I have planted the tops of pineapple in two ways. The first, soaking the severed pineapple top in water didn’t work out well. 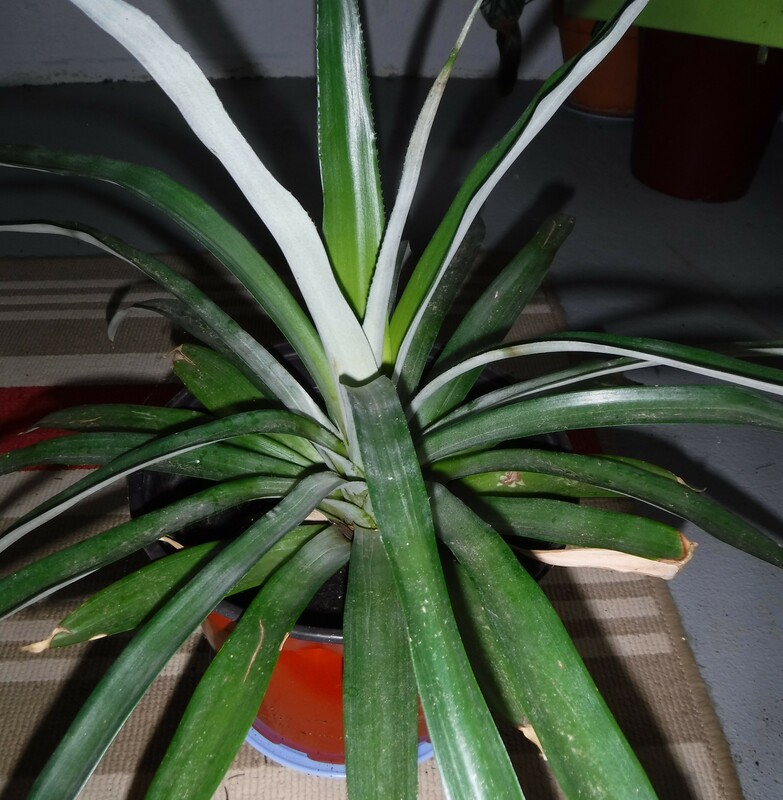 The pineapple softened and rotted in the water and the plant never thrived. The second is a better method, cut away the top leaving about a half inch portion of the pineapple, dry for a few days and then plant in soil. The result is the large plant you see above. It has been growing about two years give or take a few months. Supposedly, pineapples grown like this will produce fruit atop a stalk and then die back. Pineapples are bromeliads. Avocado pits grow well using two methods. One, suspend the pits in water using toothpicks. Leave the top half inch above the water line, the pointed end will be submerged in the water until you see roots and/or top growth. You can also plant the pit directly in the soil. Leave a small portion of the top above the soil. The key to growing avocados is having a schedule for pinching out the lanky sprout. There are many good articles on the internet about when to prune your avocado plant. Good directions can be found here: Pinching out an avocado. 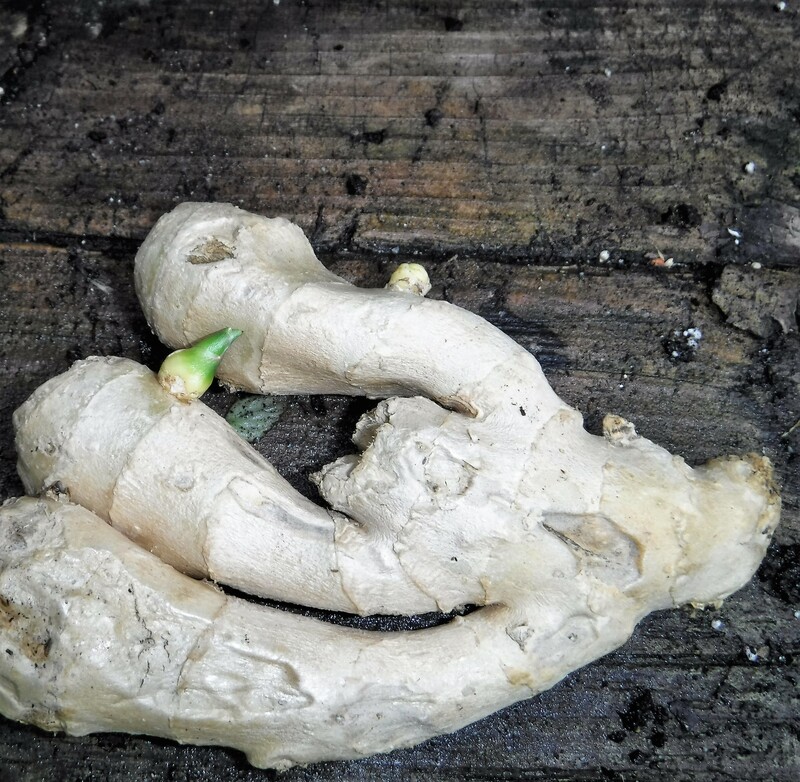 I guess it won’t come as a surprise that when my ginger suddenly sprouted I planted it in soil. Updates will follow in a few months. It’s the season of many fruits. What pits, seeds or sprouts do you have in your fruit bin? Children love these projects. Happy planting. 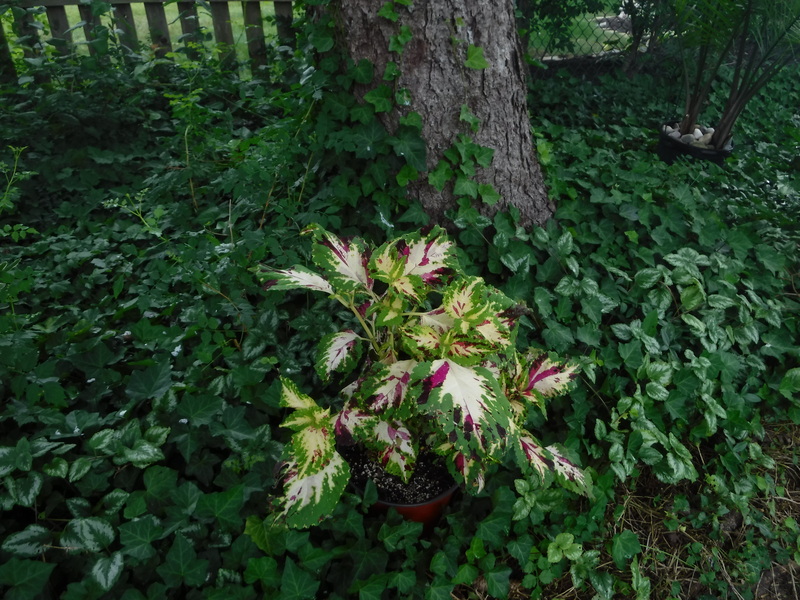 I grow most of my coleus in large pots beneath the dappled shade of pine trees. I start out with a good potting soil enriched with fertilizer. I plant three to four plants in each pot and keep a watchful eye on the moistness of the soil. It’s one of my gardening joys to watch a sprout with only the promise of color grow and develop into a beautiful and unique plant. 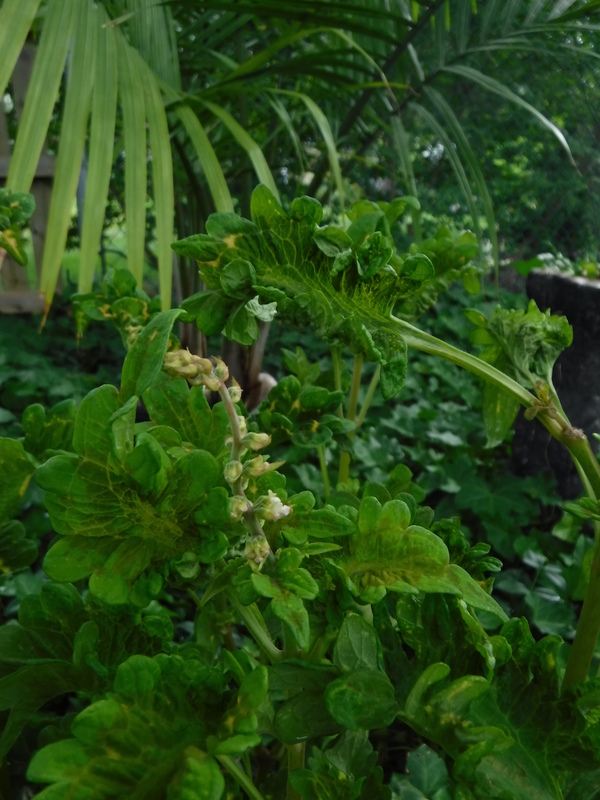 If I was growing coleus only as an accent plant in the garden I would pinch out flower stalks as soon as they appear, but for me, the emerging spiky blossoms indicate good things to come. My coleus will soon begin to cross-pollinate with each other and then produce seed for 2019. 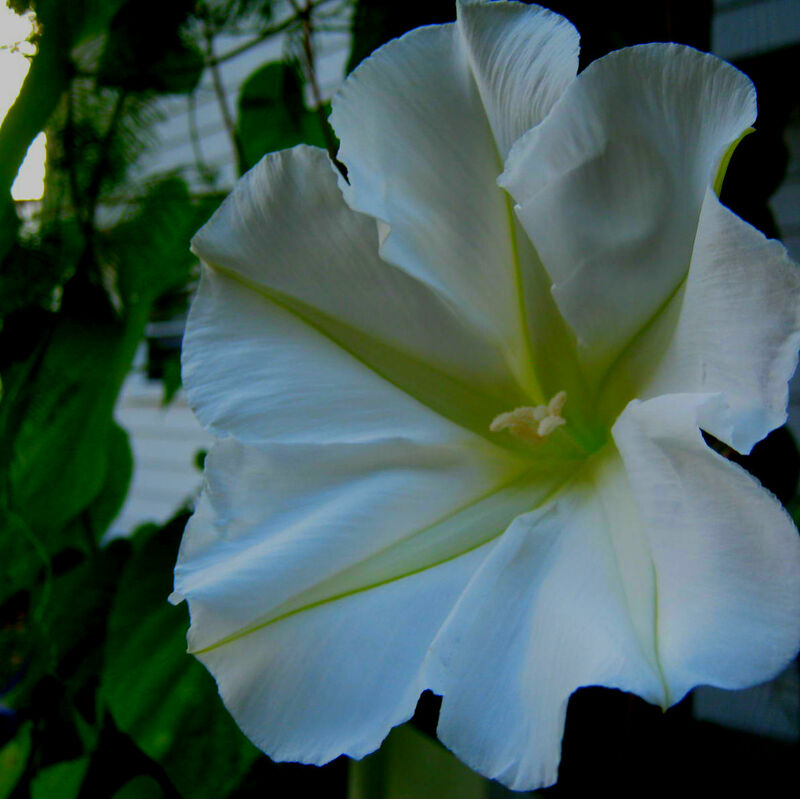 I have collected seed from my plants for many, many years. To keep only the prettiest and most unusual coleus producing seeds I will only let the best plants begin to flower. Diligence in culling out the common in appearance will assure only my favorites will be harvested for seed. I’m already excited for next year’s crop. Is that counting my seeds before they are harvested…probably! I planted three small garden patches with an inexpensive wildflower packet this year. I think I paid about 20 cents each for a handful of packets. They grew with hardy exuberance, filling the patches with foliage. When the temperatures warmed up they began to bloom in a glorious array of variety and colors. The nectar and pollen draw all types of pollinators, both large and small, and today when taking photographs I saw a few butterflies hovering over the patches. The foliage can look a little weedy and that’s okay because, in reality, many of these wildflowers are considered weeds. I love the Black-Eyed Susans that grew from the packets. 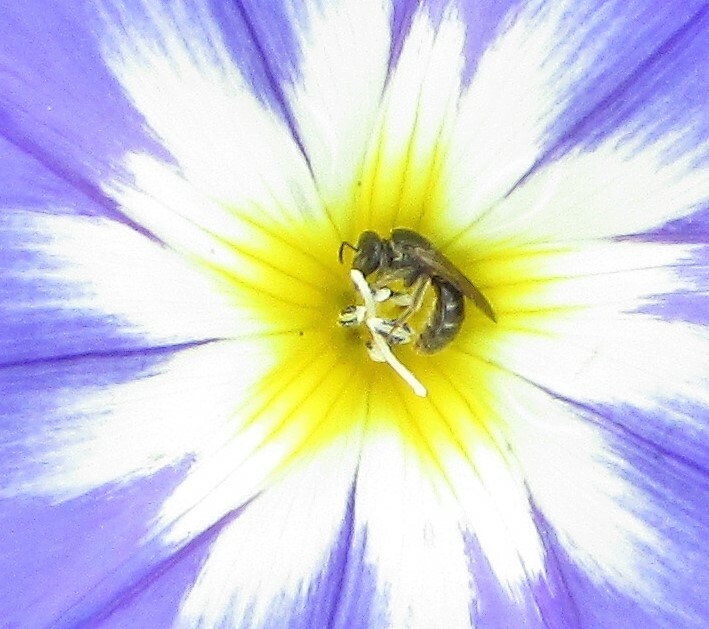 The close-up details fill me with awe over what the good Lord has created in miniature. This photo is part of Skywatch Friday. The burst of petals is reminiscent of the fireworks on Wednesday night. 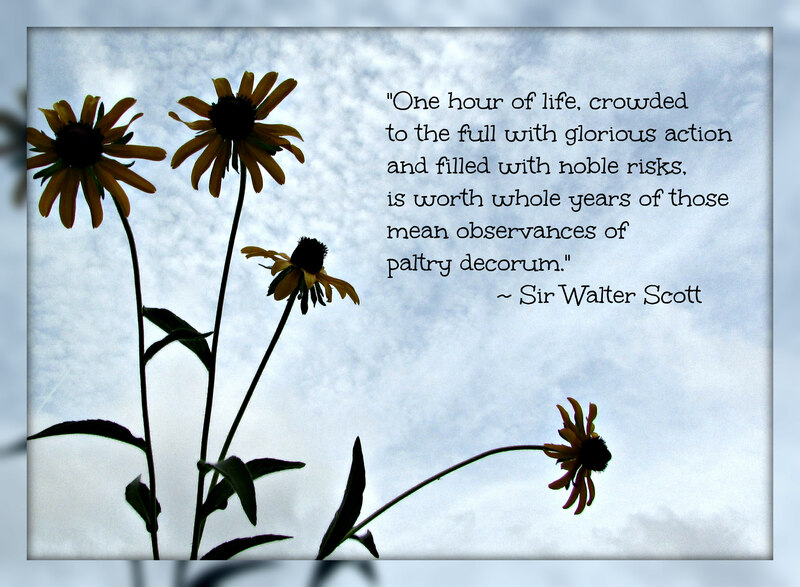 Sir Water Scott perfectly describes the way my wildflower garden grows and how I want to live my life. I like orderly garden beds that bloom with decorum at the right time and in the right place, but I prefer the glorious action and surprises in a patch of mixed wildflowers. If you press flowers, you will find that many of these wildflowers make terrific candidates for pressing, as does their sparse foliage. Sketching, painting and other forms of art using wildflowers becomes easier by isolating single varieties with a large sheet of posterboard. It’s not too late to plant wildflowers. 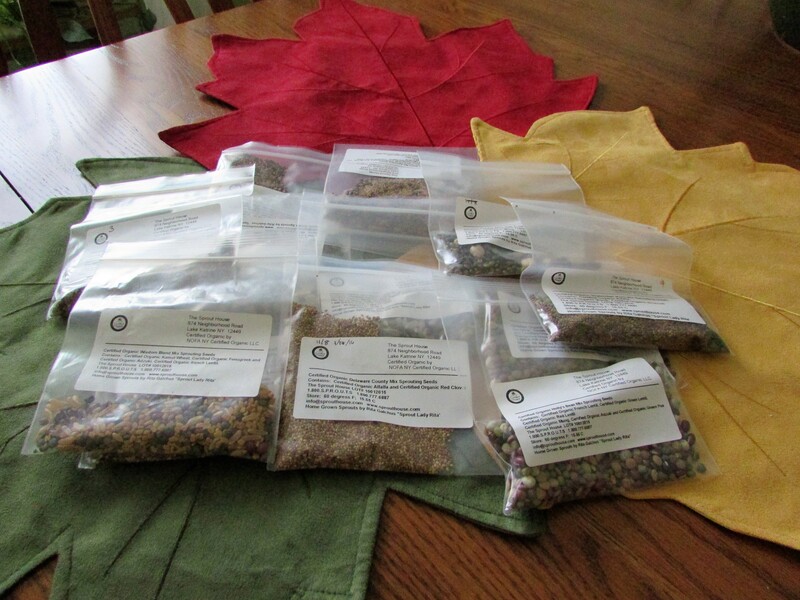 I will be adding fresh seeds to my gardens for a few weeks yet in hopes of enjoying wildflowers throughout the entire summer and fall. Over the last few months I’ve been collecting moss. A bit from here, a patch from there, I find it in places where motorcycles have created ruts on woodland paths, in deep holes dug by children for their games of war, in low places on the side of the roads I travel. Earth seems to heal her wounds in deep green moss. 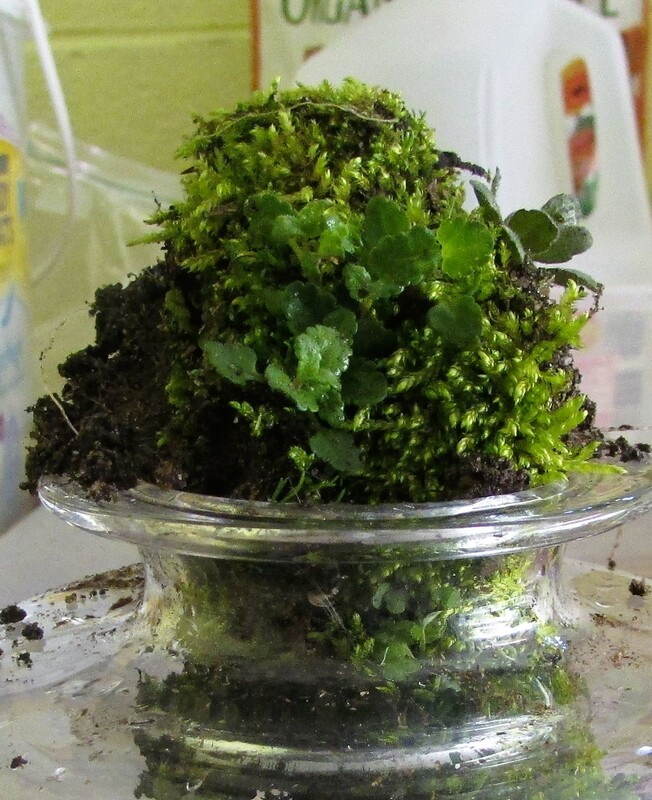 Collecting mosses is easy. I always try to take a piece that is not in an area where people walk or gather. I don’t want to blight the beauty of the landscape by being greedy. Since I’ve collected only bits at a time, the moss garden has taken about eight weeks to complete. The area is shady, the main job in maintaining and nurturing the patch will be to water, water, and water. I must be diligent in this area if I want to have success. It will still be a long shot. When the summer weather nears one hundred degrees even the hardiest plants begin to wilt. 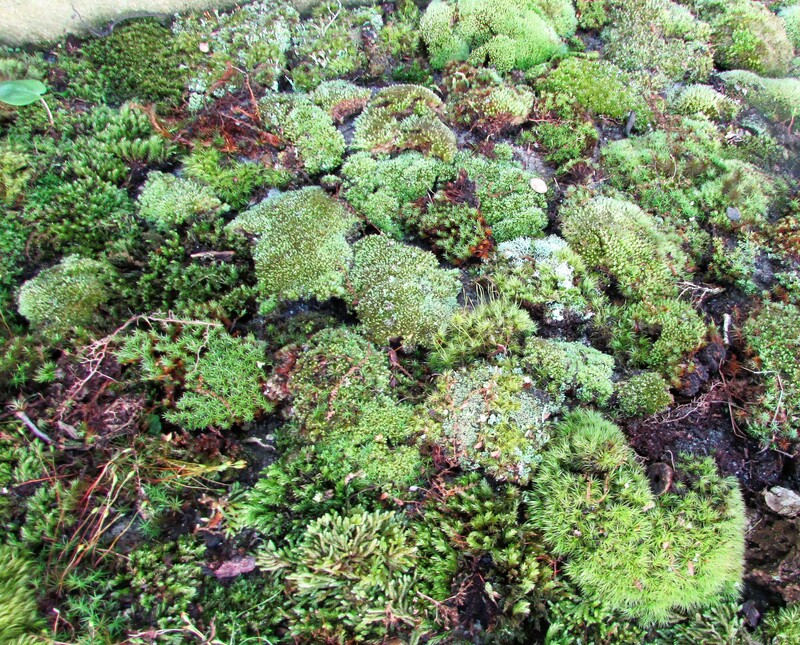 Most mosses have very shallow roots. 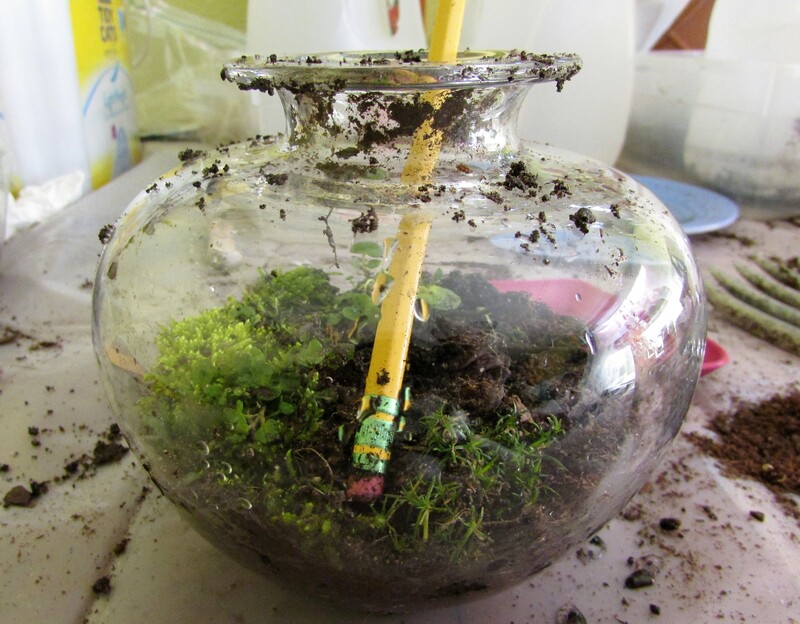 To plant I use a trowel, rough up the soil a bit, lay the moss on the stirred up ground and water. 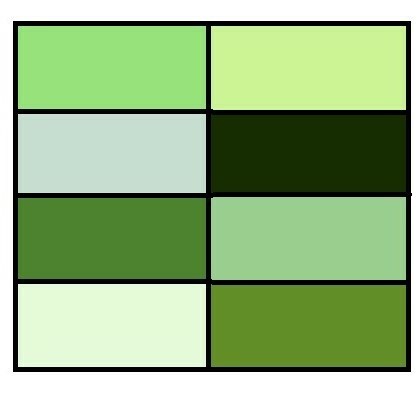 I isolated a few of the greens in the mosses, there are surely dozens more, but this is a good representation of some of the tones the moss contains. 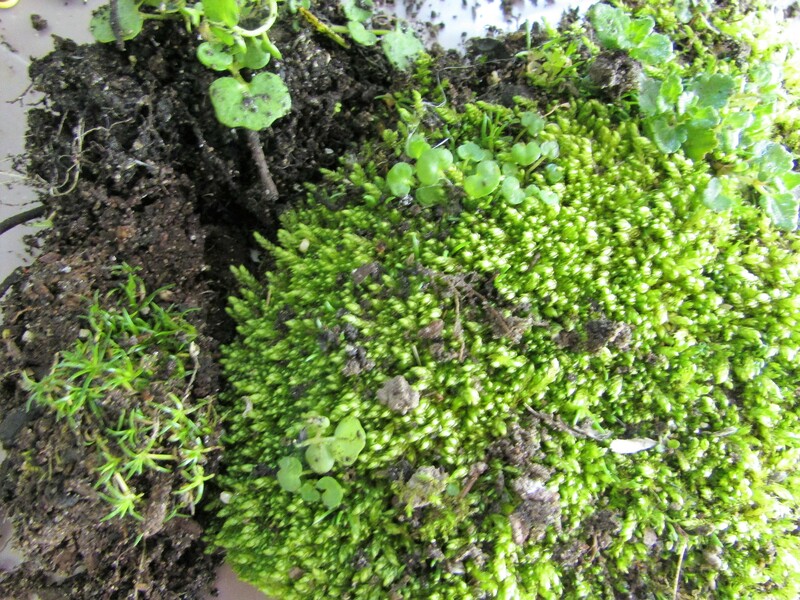 If you are interested in moss and growing a moss garden take a look at these sites. I’ve planted like a whirlwind this week. It’s been rainy, but I’ve mustered on, wearing a large-brimmed hat to keep the raindrops out of my eyes. I’m hoping my sprouts will develop strong roots before the heat gets too high. You might wonder what the strange towers and sticks are in the back of my garden. These are my sunflower towers created with soda bottles. 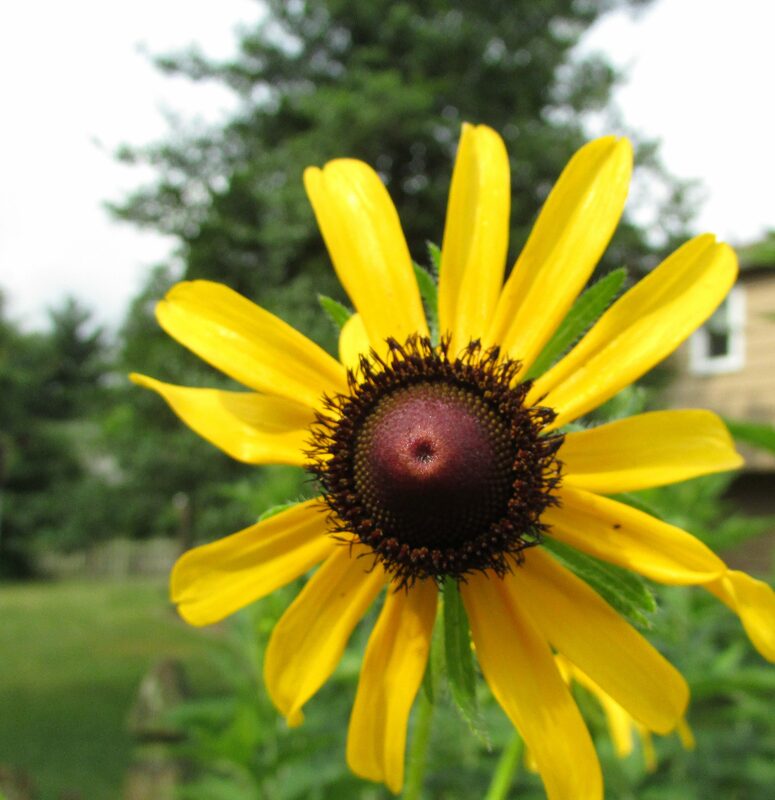 They worked well last year, and I was able to grow sunflowers in several gardens. I’m hoping they will protect my young sunflower plants from rodents large and small. 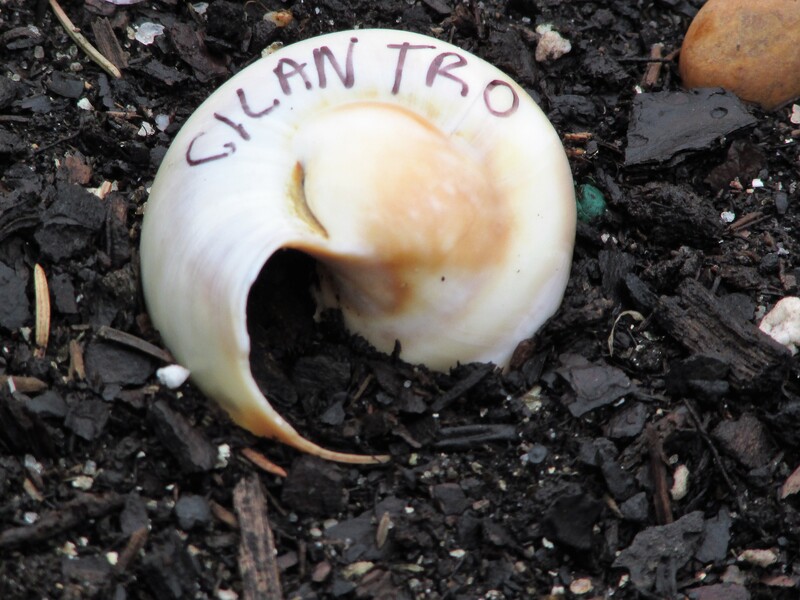 I used some of the shells I have on hand for labeling plants. The shells are doing double duty for me and work as rodent repellents. I added a few drops of eucalyptus essential oil inside the inner recesses of each shell. I’m hoping this strong fragrance will discourage four-legged varmints of all sizes. I’ve already had to replant some seedlings chipmunks and squirrels unearthed in their constant quest for seeds. Last week, I saw my nemesis for the first time this season, that dastardly groundhog who mows down my beautiful plants like a John Deere tractor. He was wary though, I think he remembers his close encounter with the marbles I sent his way last year with my trusty slingshot. Or does he remember the time I chased him yelling like a crazy person and swinging a broom? When I saw him this time I yelled, “GROUNDHOG!” He heard me and ran before I could chase him down. I ended up laughing at myself, when did I start hollering like Granny of Beverly Hillbillies fame? I sounded just like her when she used to get aggravated with Jethro and yell his name. Oh my! Granny once looked like an old, old woman to me. How did she grow so young, and how did I grow so old? Life…it goes so fast. Now, back to chasing that groundhog…that will keep me young! 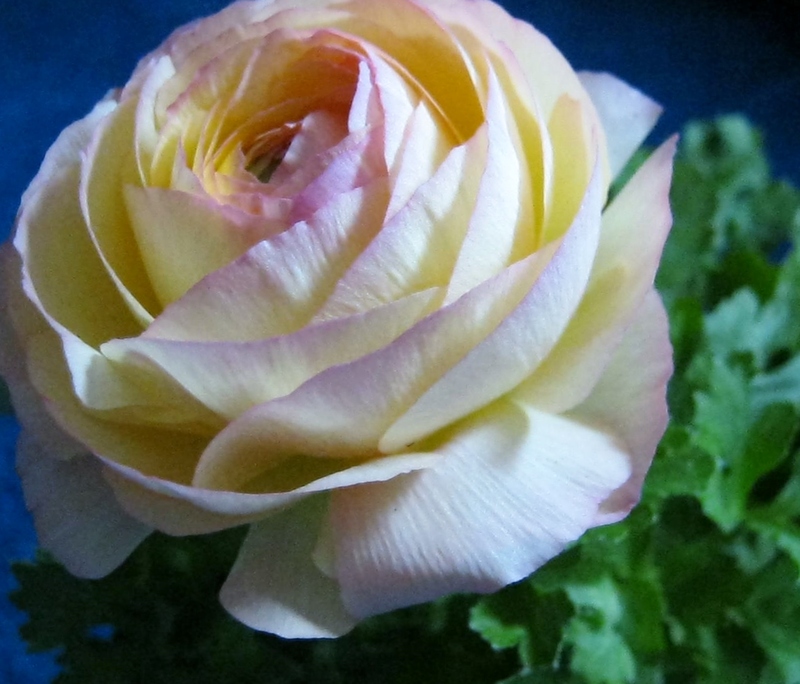 I love Ranunculus flowers. In years past I’ve bought them as potted plants at a local farm stand. This year for the price of one plant, I bought a package of ten tubers. I read that the tubers are less brittle and easier to handle if you soak them for a few hours in water. I did this, and they plumped up nicely. I planted each one in a separate pot and put them in a sunny window. 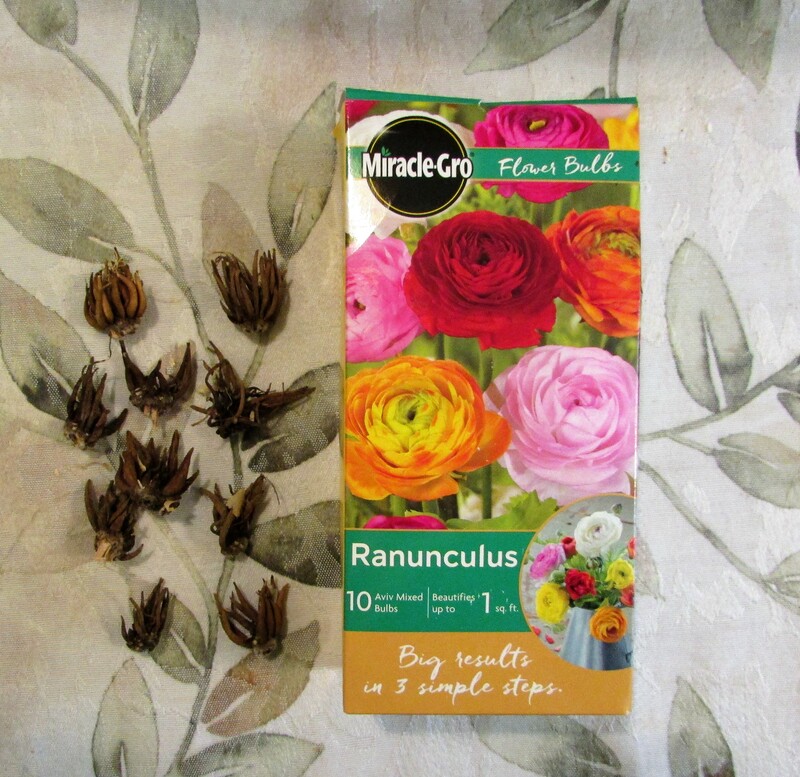 Hopefully, in a few months I will be able to update this post with some photos of blooming Ranunculus. The coleus I’m rooting for Spring, is a cutting from a rooted and transplanted cutting I took in the Autumn. That’s a bit of a tongue-twister, isn’t it? 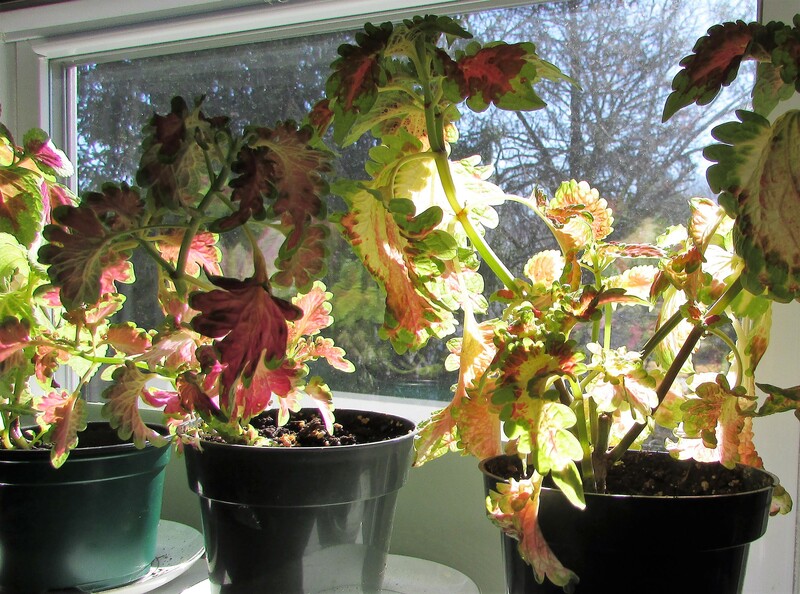 I took about a dozen cuttings of my favorite coleus before the first frost, and they are rooted and growing strong on my windowsills. They will be replanted outside in pots in the first few weeks of May and be grown beneath the pine trees in the ivy beds. Coleus thrive in this area and add a lot of color to the gardens. I’m partial to the light yellow colors that several of my coleus have developed over the years, and tend to plant and root more of these each season. 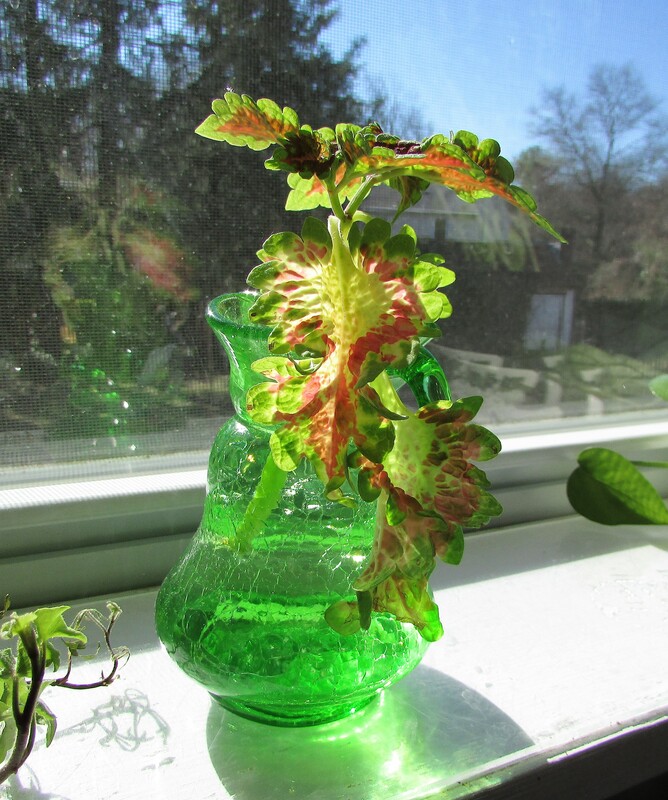 Rooting coleus cuttings is easy, cut a sprig from the mother plant 4 -6 inches tall, place in water, and wait a few weeks for roots to develop. When the roots fill the container, plant in potting soil. I have great luck doing nothing more than these easy steps. 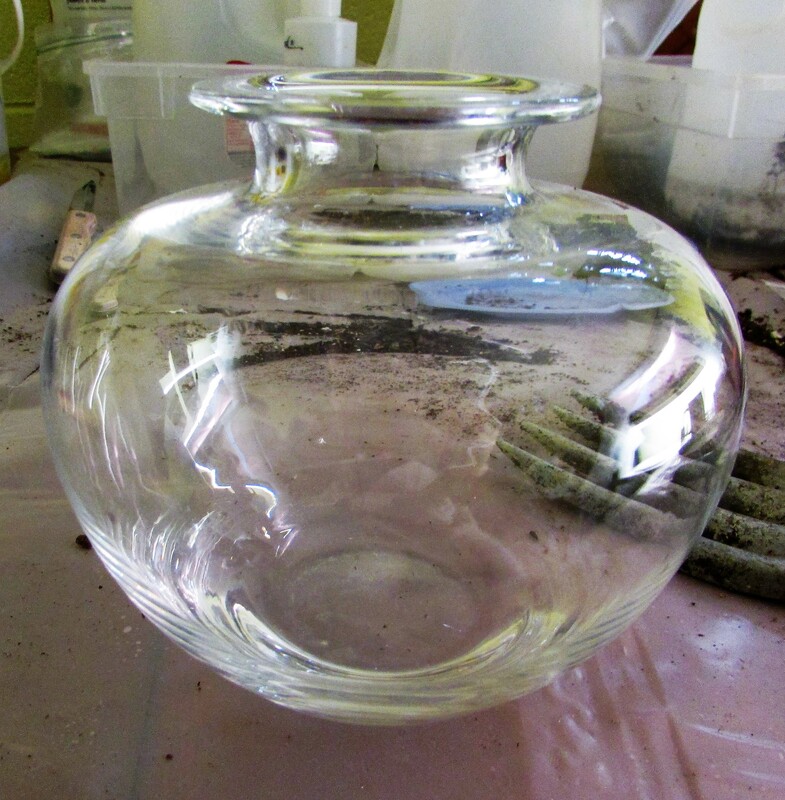 I chose a thrift store vase for this project. 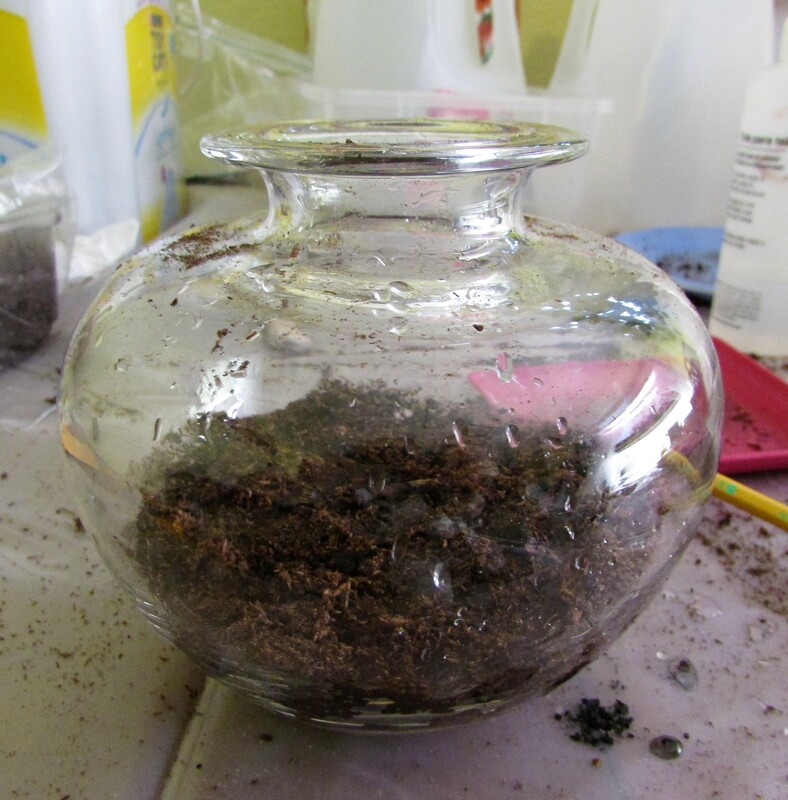 The bottom is heavy, a good choice since this will keep the terrarium from easily flipping over. And a beautiful Block Island stone with a stripe running through it…magical! 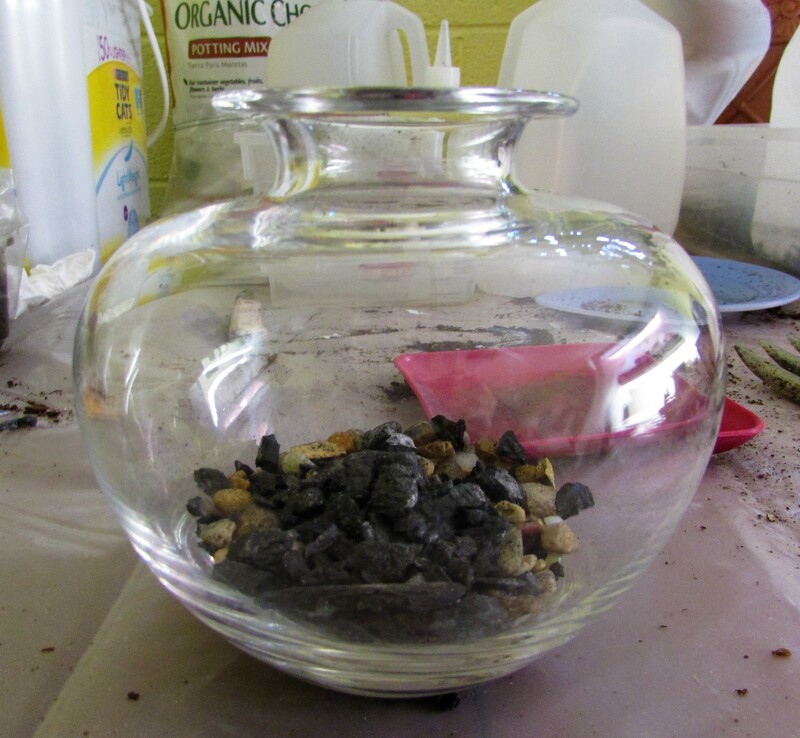 This post will be continued next week with a surprise upcycled stopper for the terrarium top. The seed racks are out in stores. Hooray! I picked out three packets to sow this weekend. Each of these varieties need a lot of grow time to reach a size that will thrive outdoors. I will soak all of these seeds in water for a few hours before I sow them. 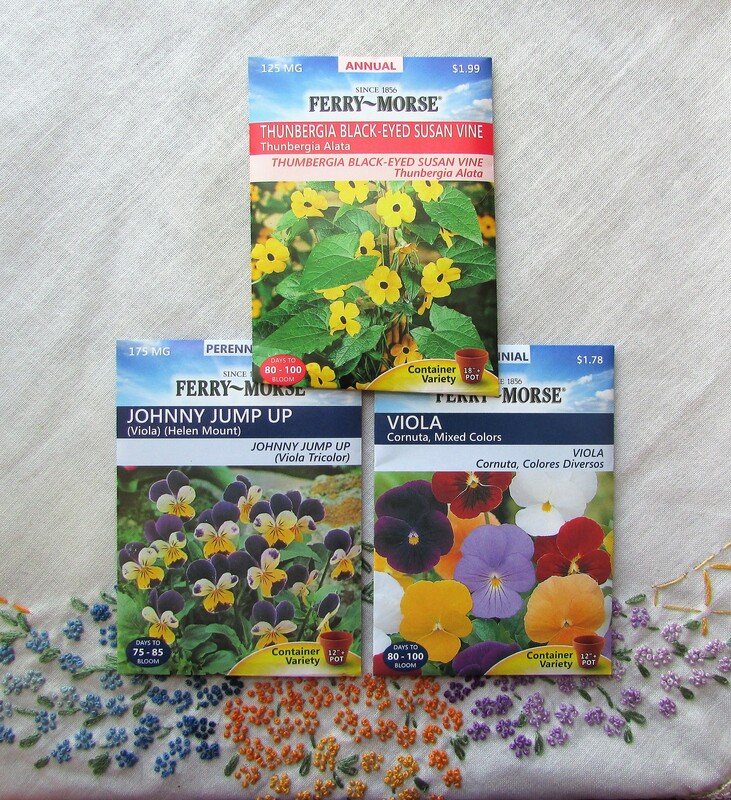 The violas/pansy/johnny-jump-ups needs darkness to sprout. I’m going to cut down a outdoor garbage bag to cover the container. I’ll update as the seeds progress. The weekend is coming, take some time to browse through the seed racks and dream of Spring. Winter arrived Saturday night here in southern New Jersey. We had watched the forecasts, knew she was barreling toward us, and sure enough we heard the knock of her wind right before we went to bed. Sunday morning dawned cold and blustery. Our mailbox was a casualty, knocked off our porch, we found it on the neighbor’s front lawn. Gardeners, like me, are probably mourning the end of the season. The good news is the first of the seed catalogs has already arrived at my house. At this time of year, I also appreciate my sprout and micro-green seeds. The nutrient-packed food they produce is not only good for my body, but an excellent remedy for the grief the gardener in me feels when outdoor planting and harvesting comes to an end. If you have leftover vegetable seeds from the garden, many of them can be grown as microgreens. Anyone who has read my blog over a period of time knows that I love the garden plants that spring up as volunteers. 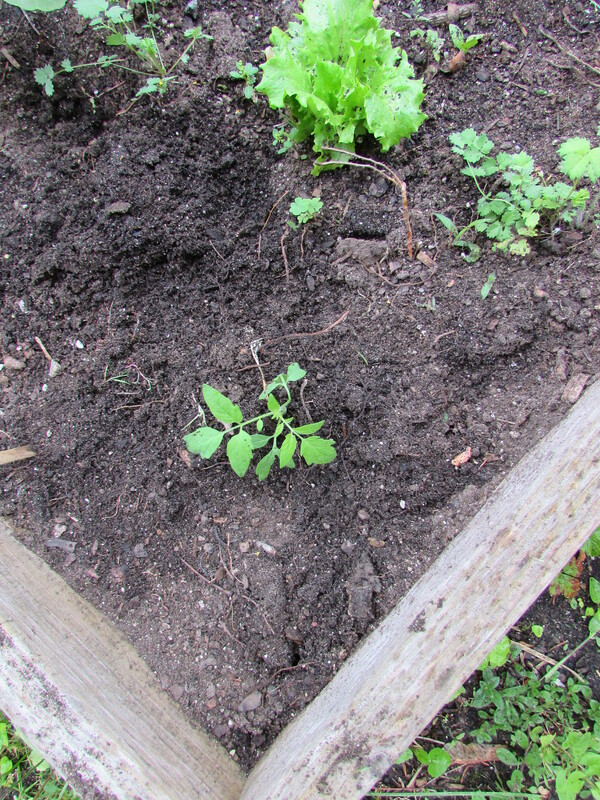 I found a few volunteer tomato sprouts amongst my roses and blue lobelia this week. 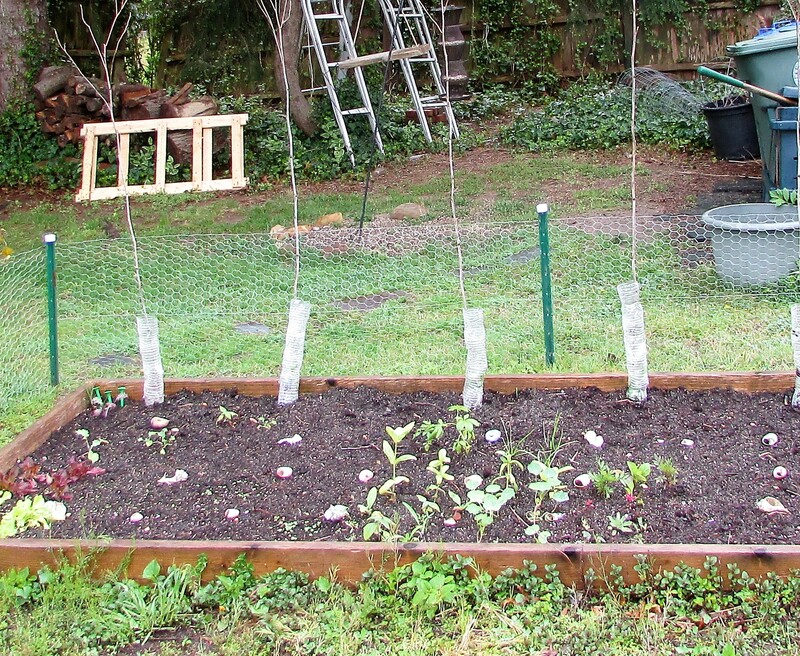 (The sprout in this post stands to the left of the larger plant in the photograph) My best guess as to the original location of the seed was soil I used this year in my winter sowing . Happily for me, an empty spot in my Square Foot Garden was the perfect fit for my volunteer. I dug up the sprout, transported it on my trowel, and planted. It’s a mystery as to the variety, and that makes it all the more fun. Oh the gardening life…what a joy! 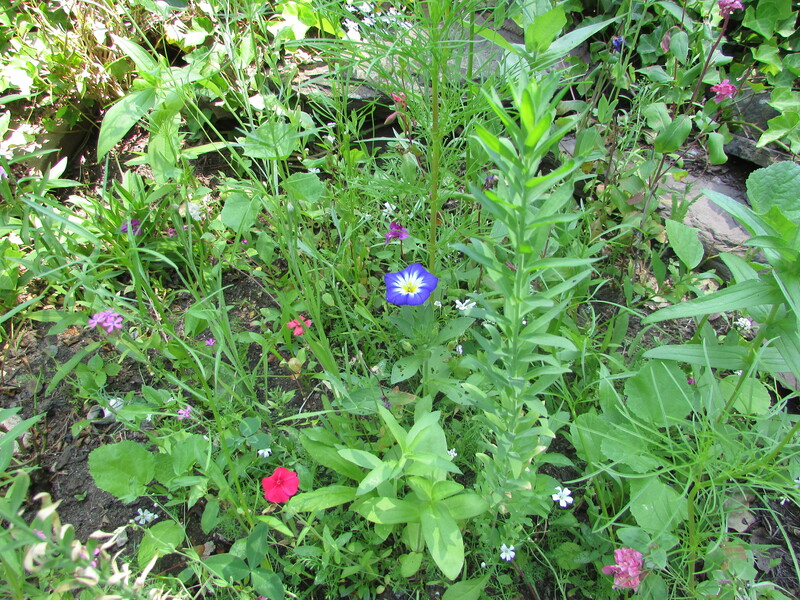 In the Spring of 2015 I sowed several packets of wildflowers in my garden beds. They performed well, and I enjoyed the surprise of seeing well-known and less common varieties of flowers grow and blossom. The biggest surprise are the biennials and perennials that returned this year. Oh the joy of seeing an unknown plant grow, bud and blossom into this lovely cantaloupe-hued flower. 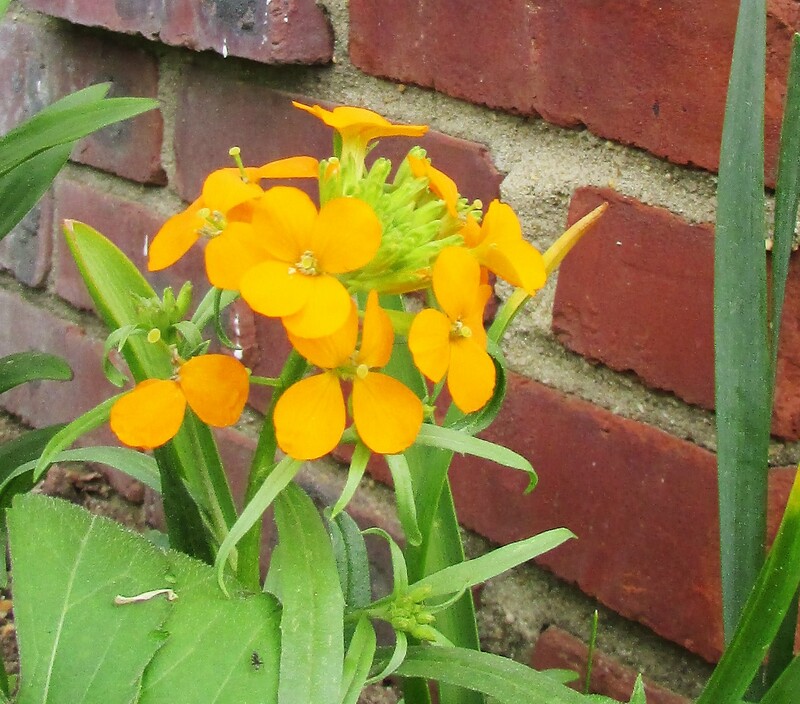 Even better, the scent of these Wallflowers (Erysimum cheiri) is sublime. 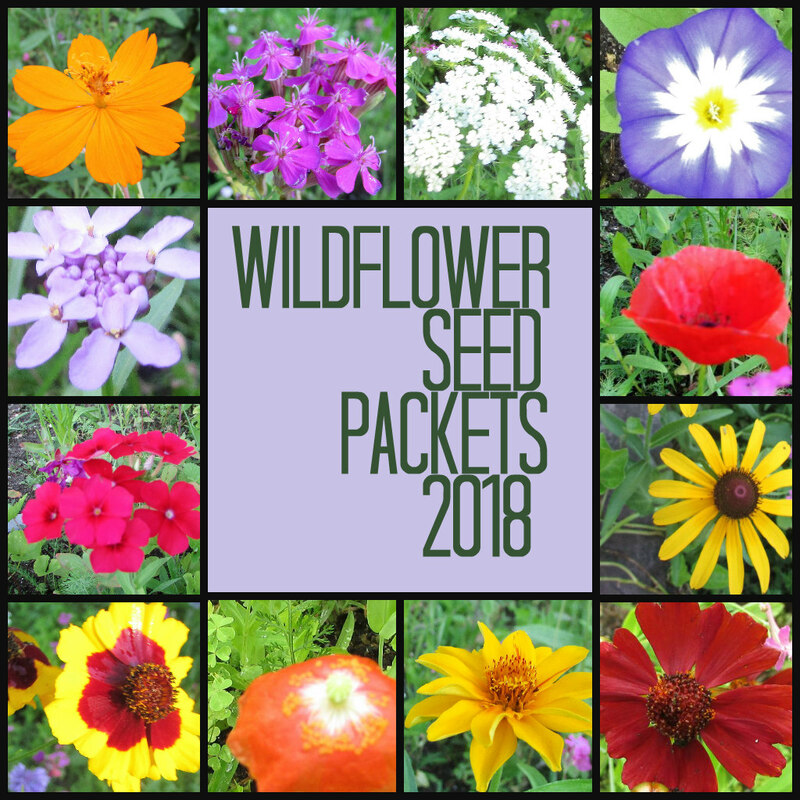 Wildflower packets run the gamut of price points, from 25 cents in dollar stores, to near $10.00 for a large box with shreds of colorful mulch included for easy and even sowing. 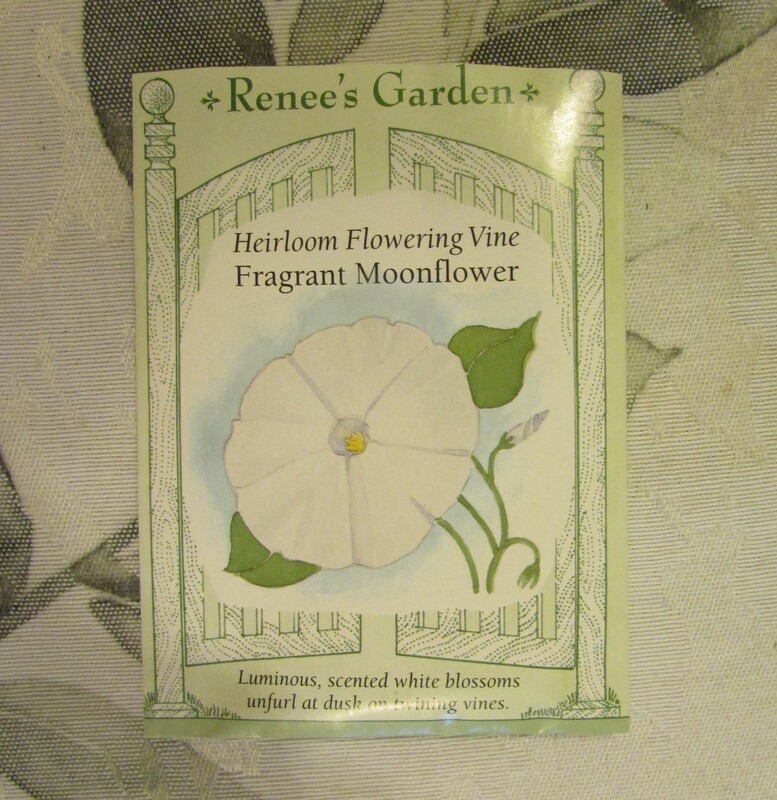 I’m enchanted by my wildflower garden and bought a few more packets to add to it this year. 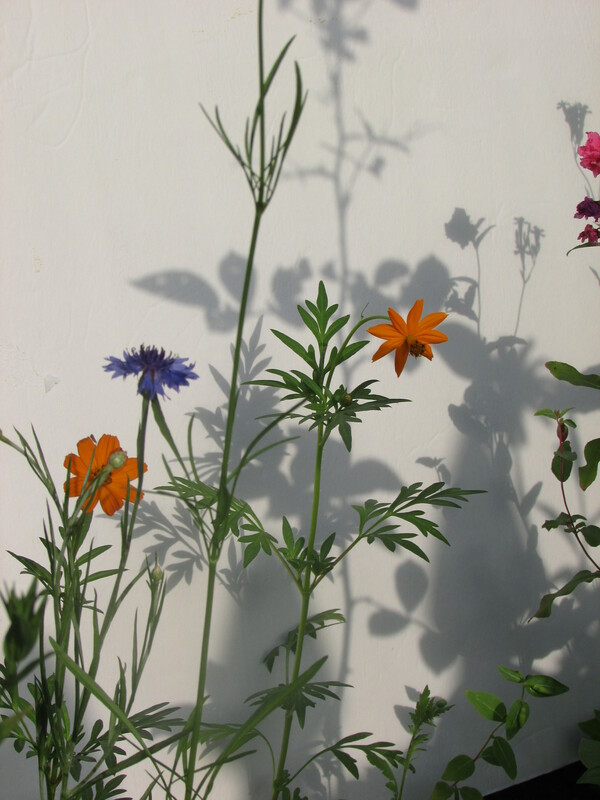 My method of sowing wildflowers starts with roughing up the garden soil with a trowel. If needed, I work in a bit of fresh soil, then I SPRINKLE the seed and STEP gently over the entire area. A light spray of water helps the seed stay in place. In a few weeks new wildflower plants will be my reward. In the Spring, garden seed racks are available in almost every store I shop in. It’s hard to resist taking a moment to look over their display in search of something new. I’ve noticed almost every seed company offers a packet of mixed flowers that will draw butterflies. I enjoy growing flowers for butterflies and find zinnias are a favorite of the delicate winged creatures. An additional way of bringing butterflies into your yard is to grow the plant/plants they use as a host for their offspring. 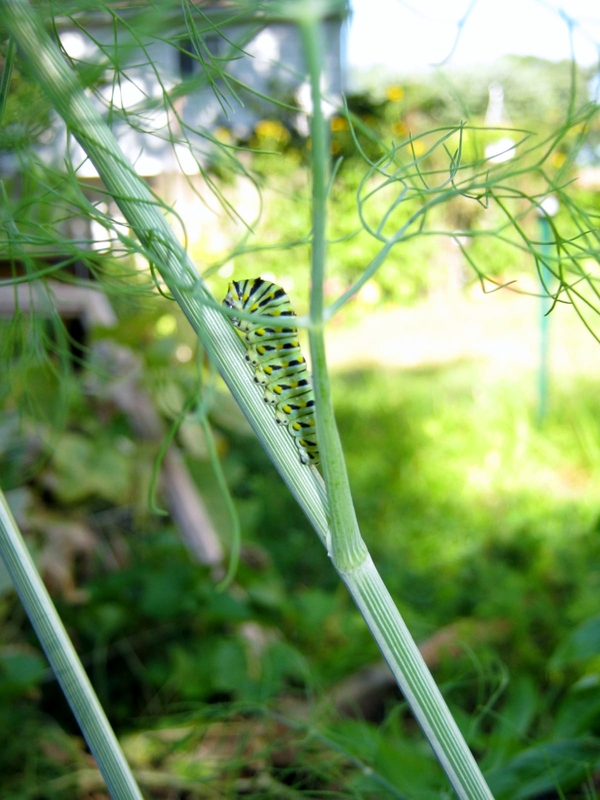 Dill is one of the best for attracting swallowtail butterflies to your yard. 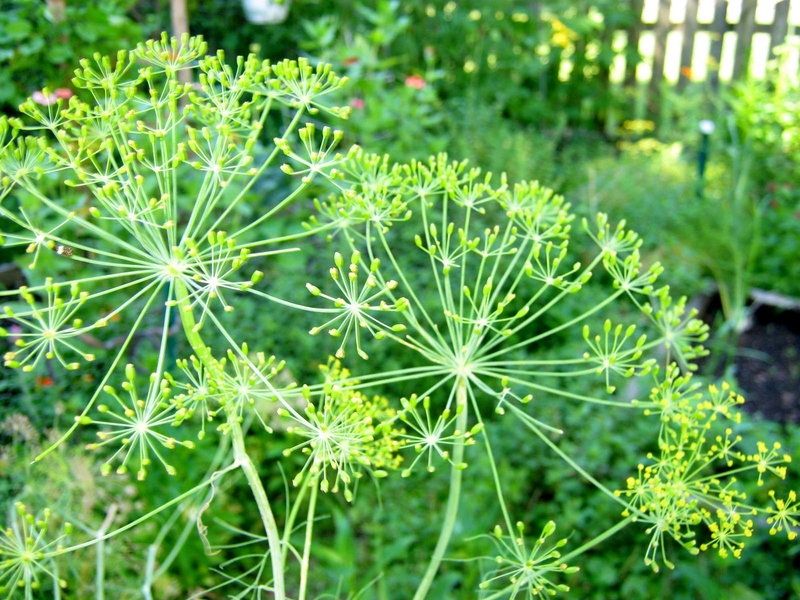 Dill is readily available as a plant or seed in most garden centers. Dill is easy to grow and a good choice for a child’s garden. The yellow flowers resemble a burst a fireworks, and the seeds they develop can be collected for cooking. The fern-like foliage is a perfect addition to many recipes. 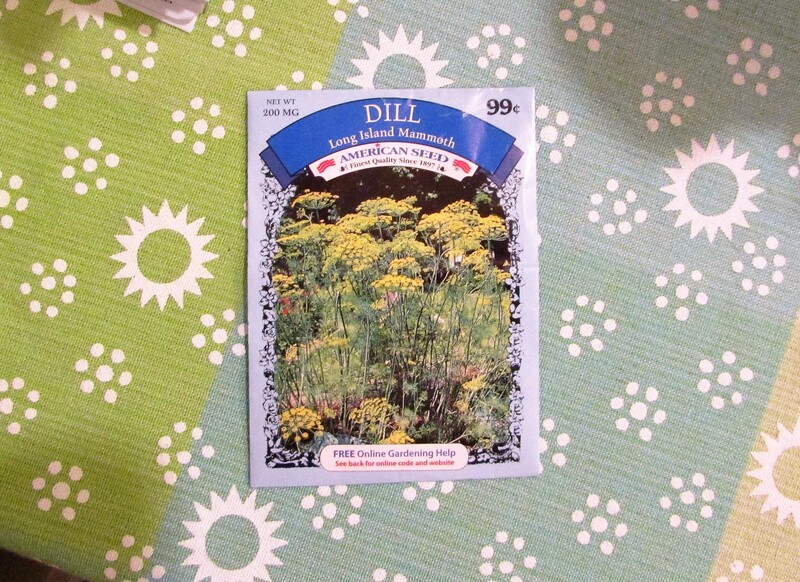 I sow dill seeds directly in the garden beds, and also start it indoors for quicker blooms. Give dill a try, you won’t be disappointed. 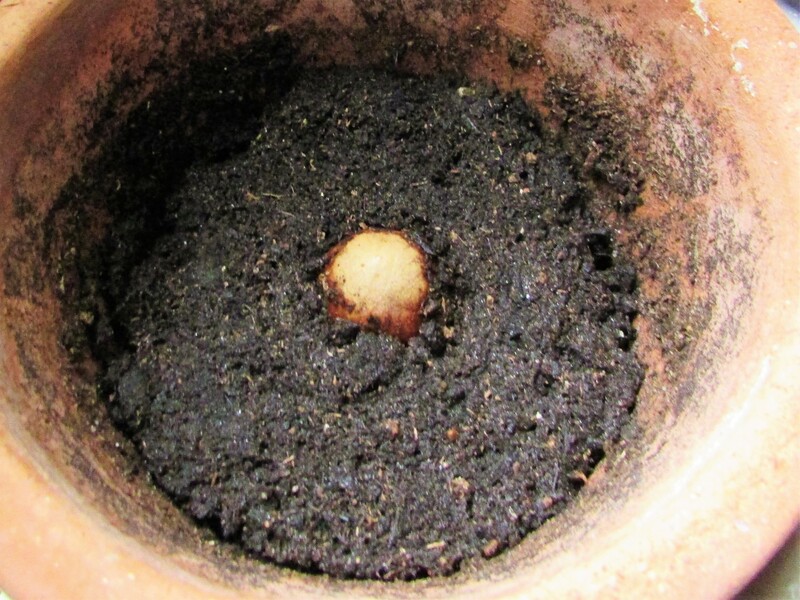 Planting – Avocado Pits – Again??? 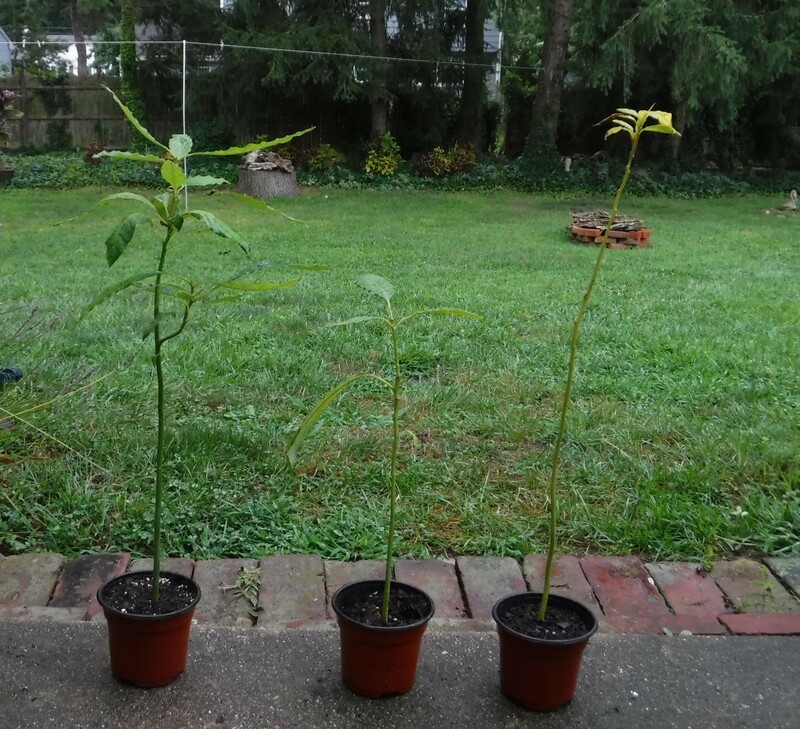 Recently, while talking with a blogging friend, Susie, of the SusieShy45 Blog, we both agreed to attempt growing an avocado pit at the same time. We will be comparing notes on our progress through the comment section of this post. Please do join in if you eat avocados and want to give growing it a try. Add your thoughts and progress to the post in the comment section. I have two pits saved, so I’m going to try growing them in two ways. For the first, I suspended the flat end (the rooting area) in water, and kept the pointed end (the sprouting area) above the water line. I placed my pit in a vase with a perfectly-sized opening to hold the pit. 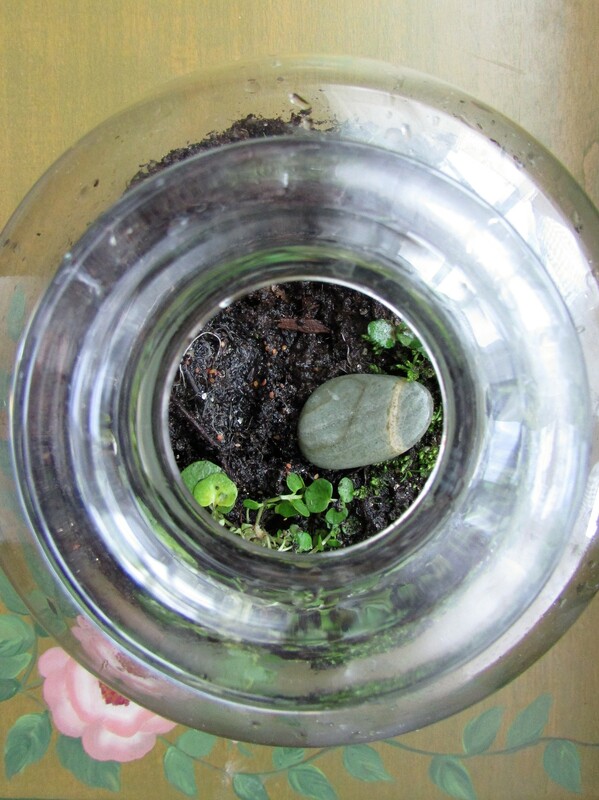 Another way is to suspend the pit with toothpicks inserted a quarter inch or so into the sides, and the bottom placed in a glass or jar of water. I planted my second pit in a pot with dirt, pointed end up. It will be a race to see which one sprouts first. Anyone else out there with an avocado pit, or a ripe avocado on hand??? Join in and let us know how your avocado grows.